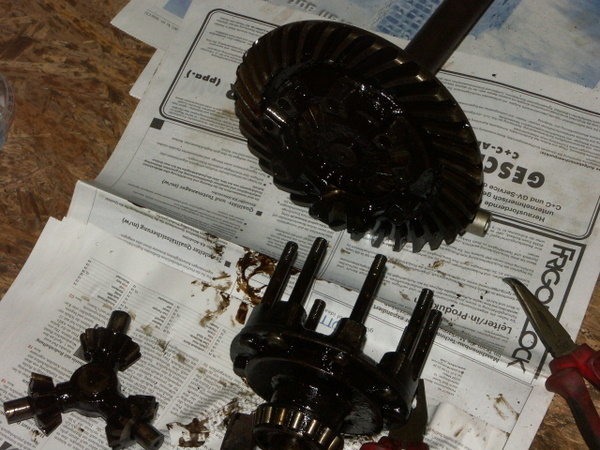 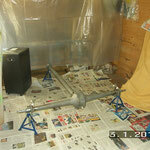 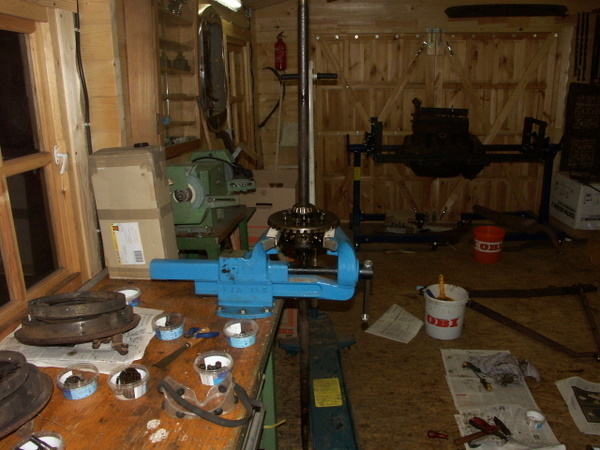 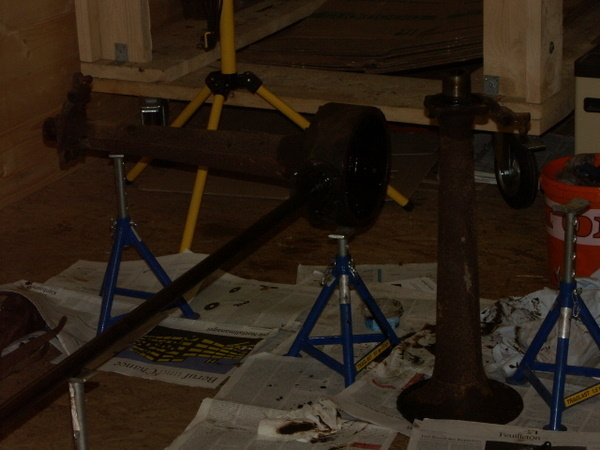 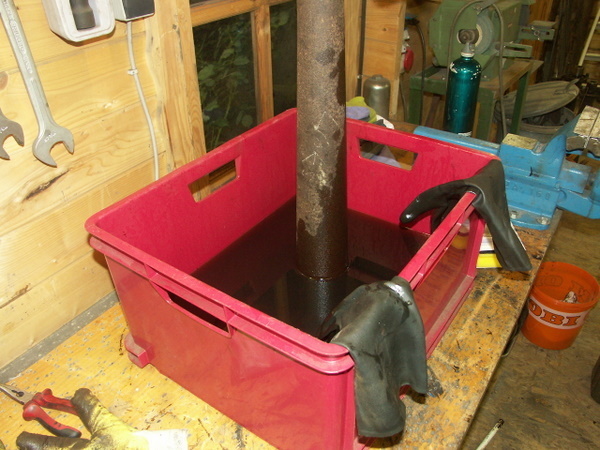 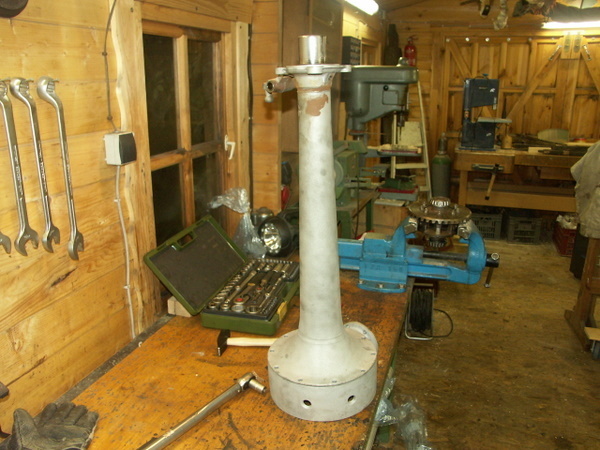 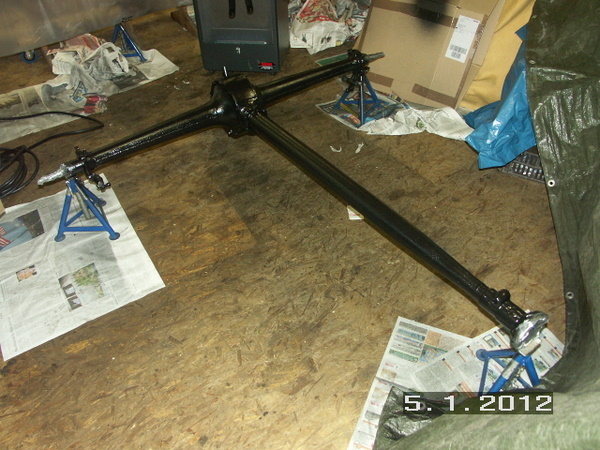 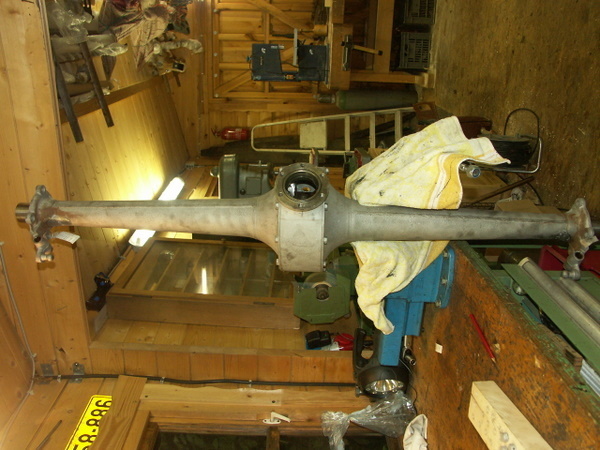 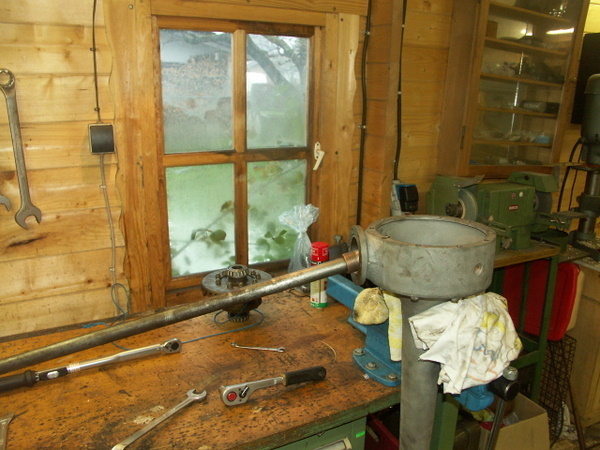 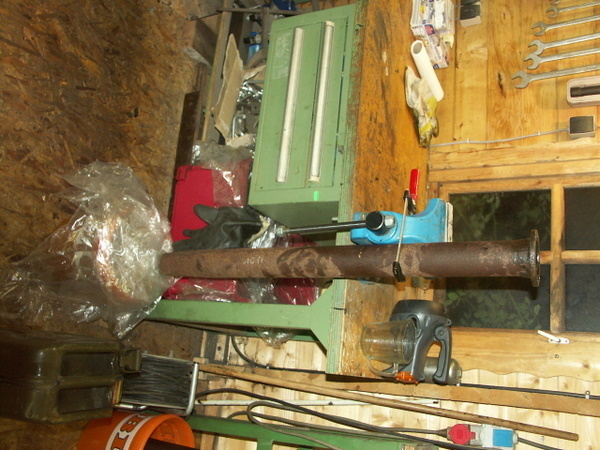 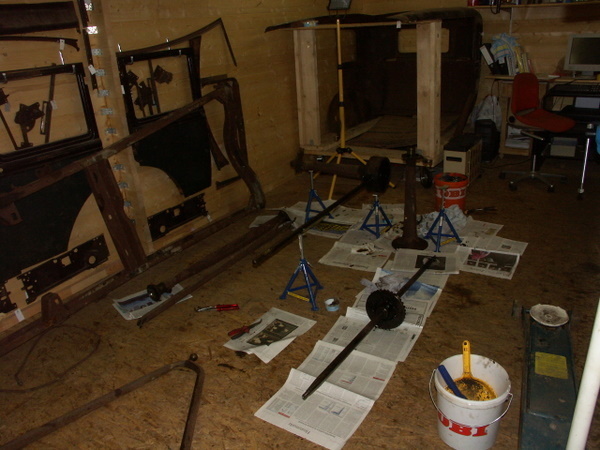 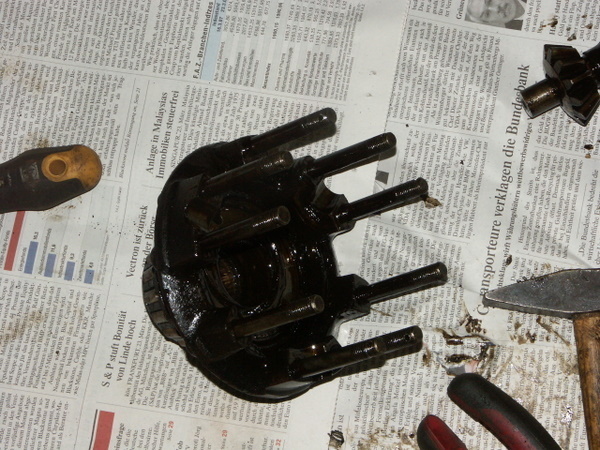 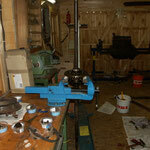 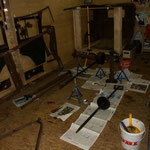 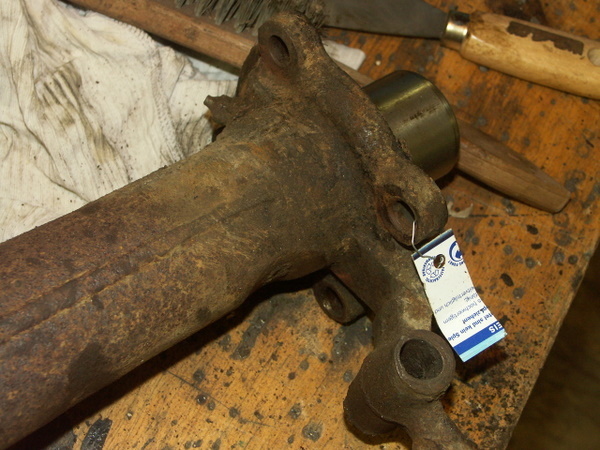 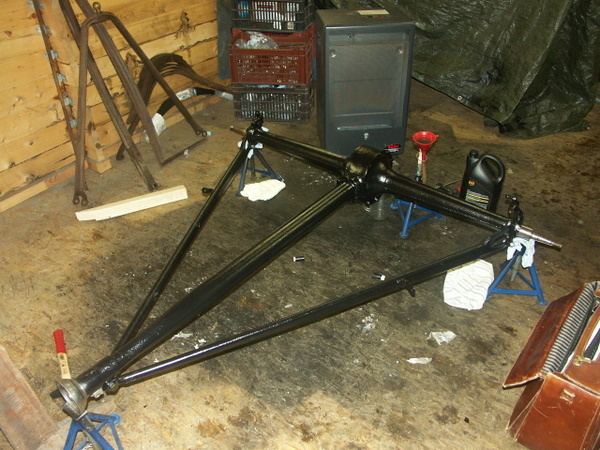 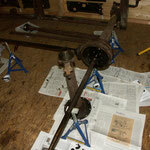 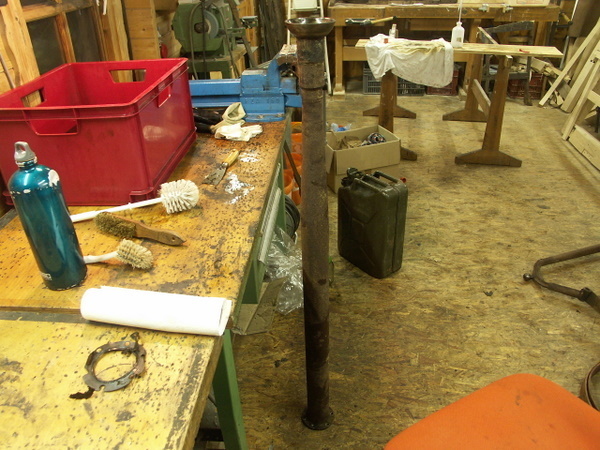 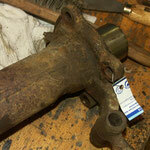 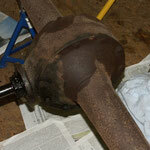 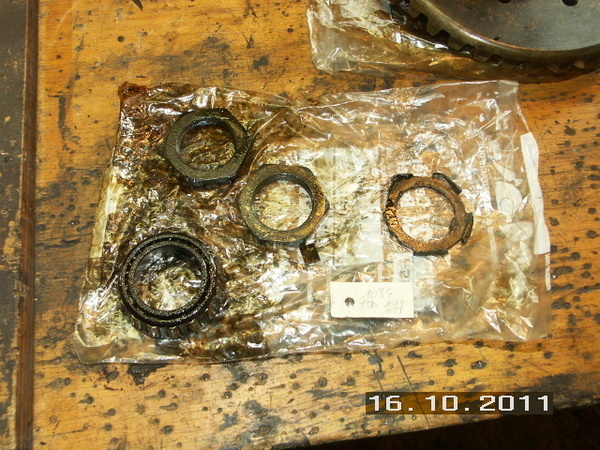 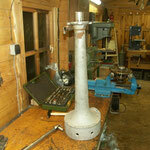 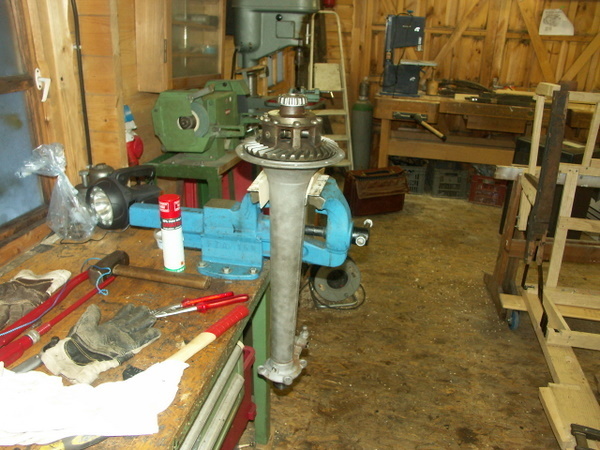 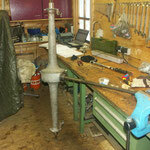 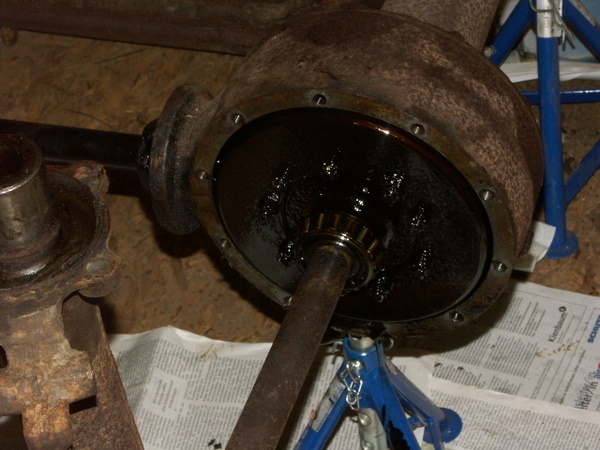 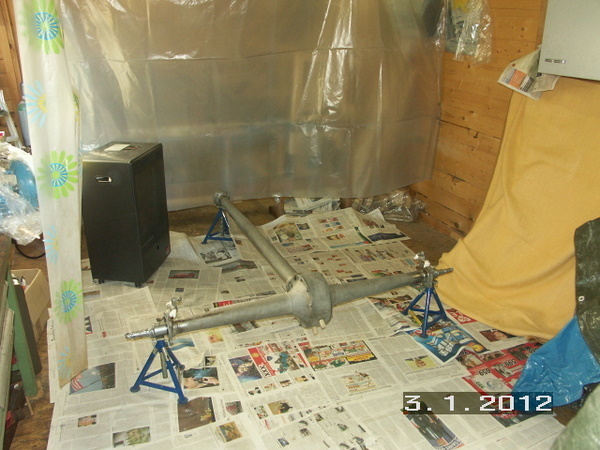 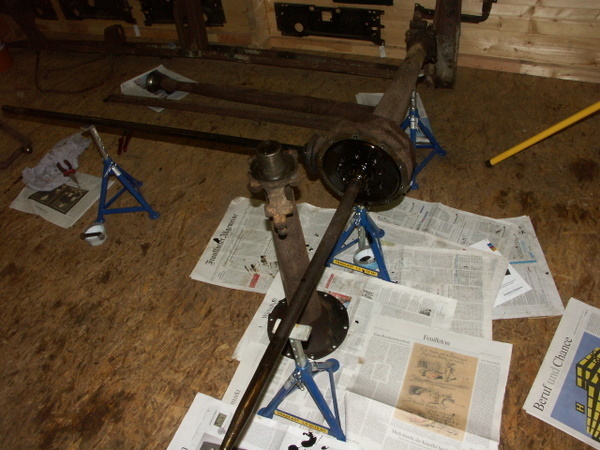 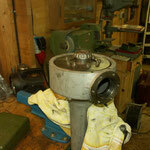 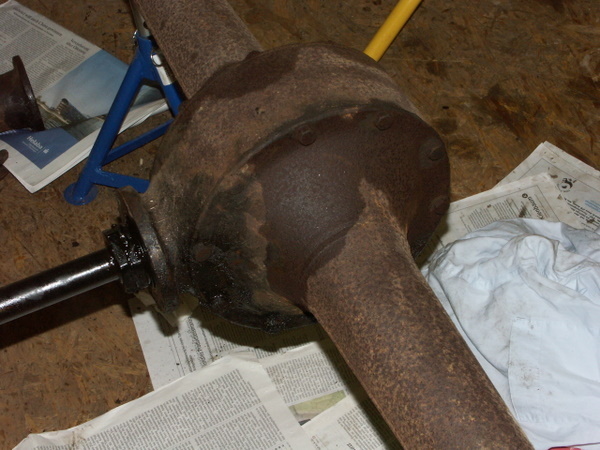 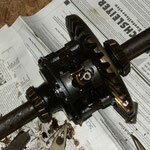 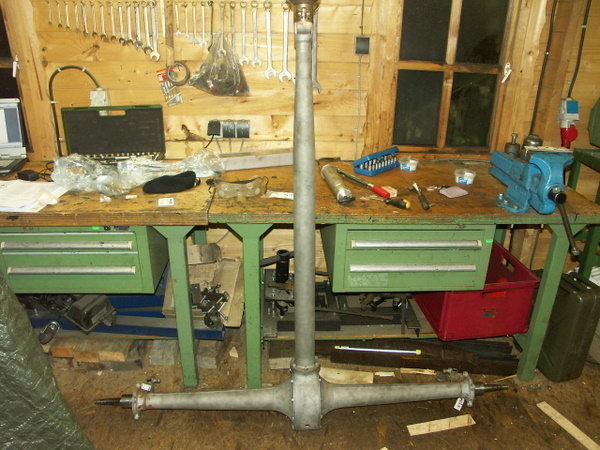 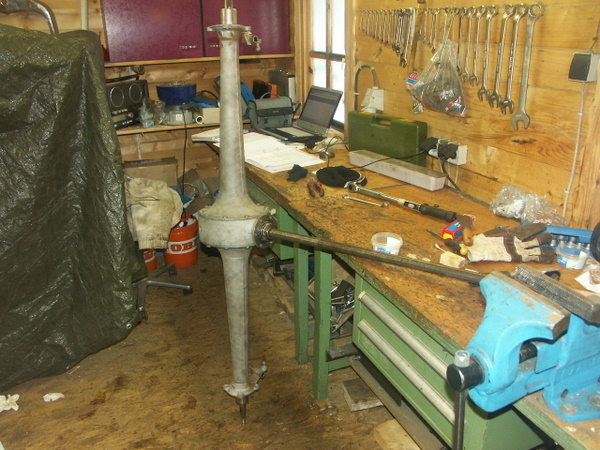 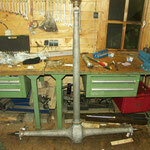 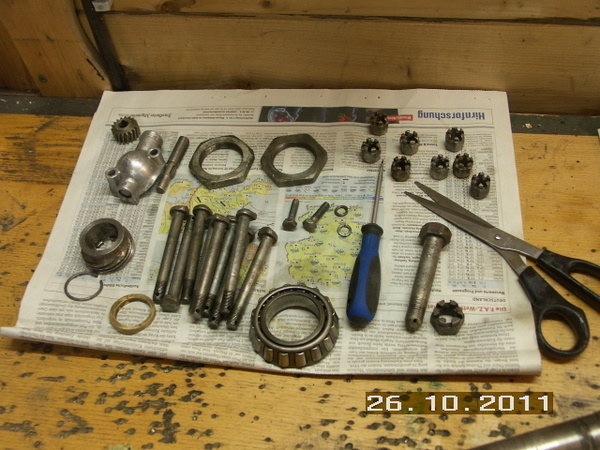 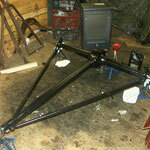 The Rear Axle and Drive Train were taken apart and alle parts cleaned in Diesel. 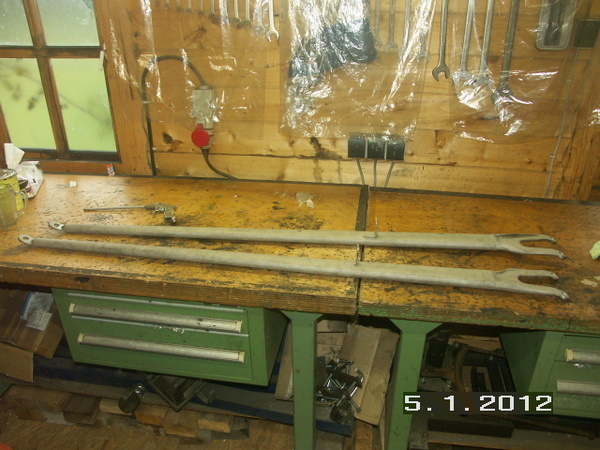 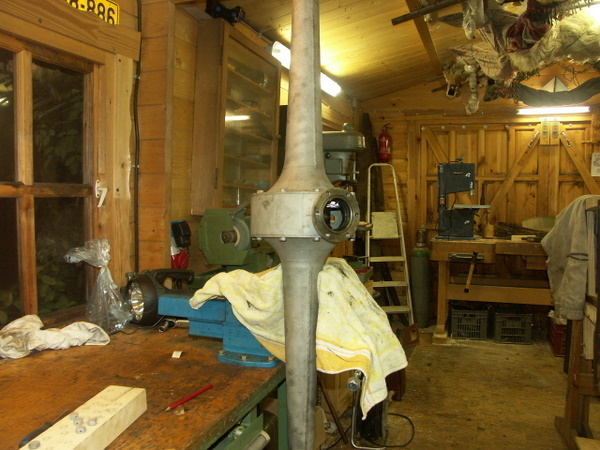 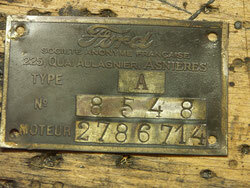 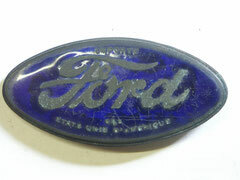 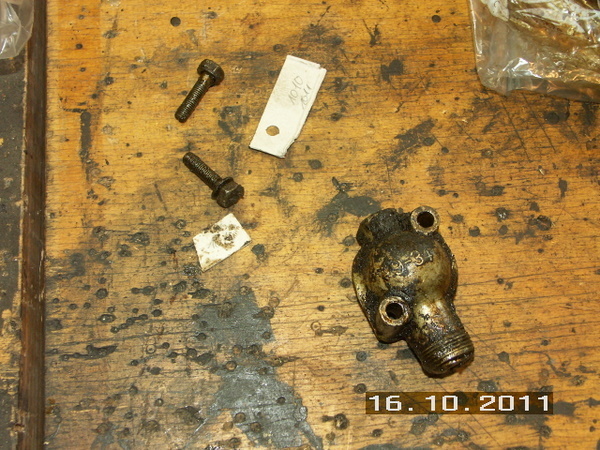 The exterior parts were sand blasted. 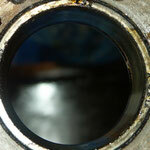 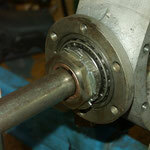 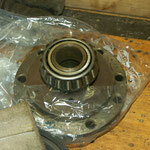 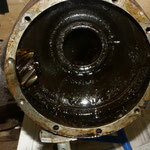 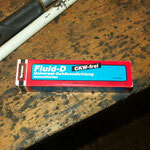 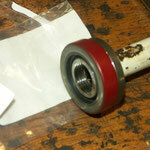 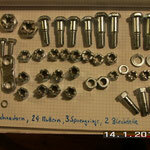 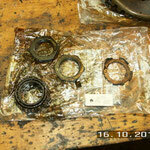 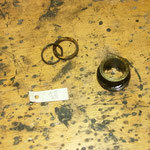 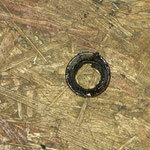 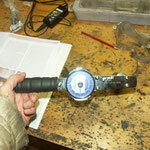 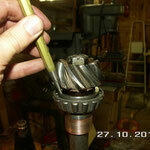 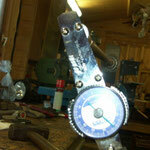 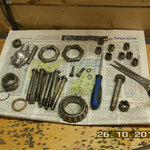 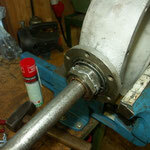 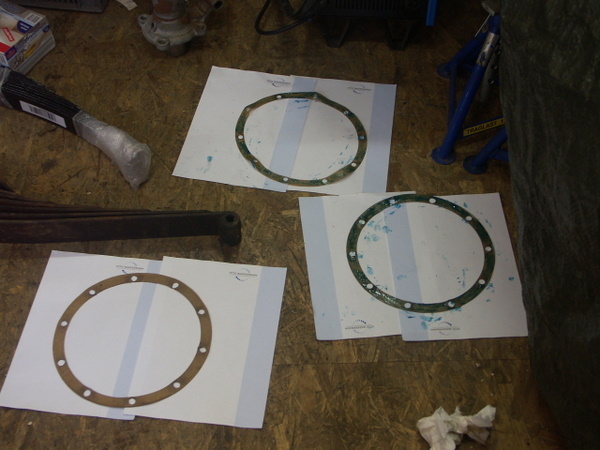 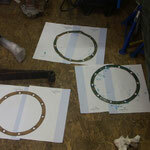 All bearings and bearing races were replaced. 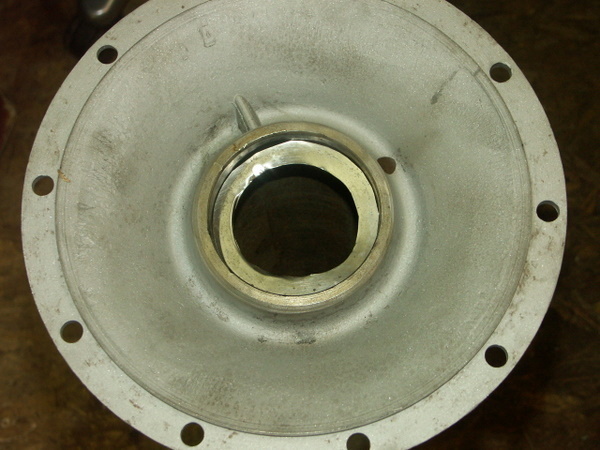 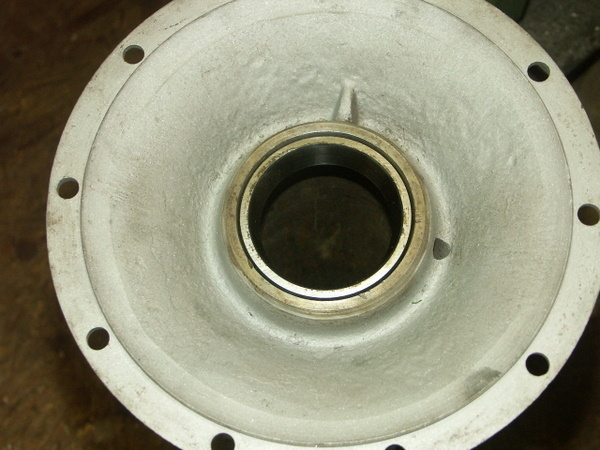 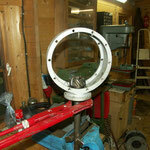 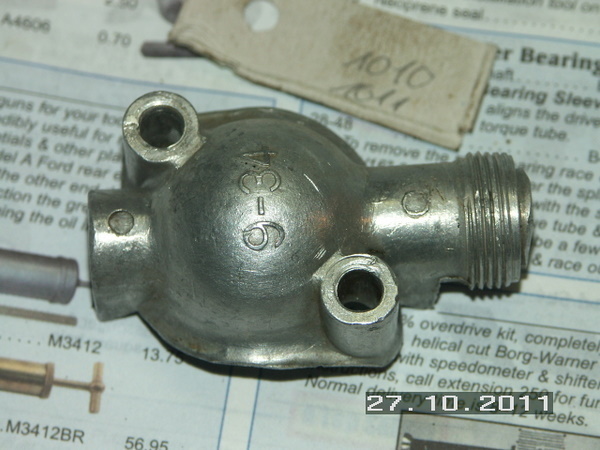 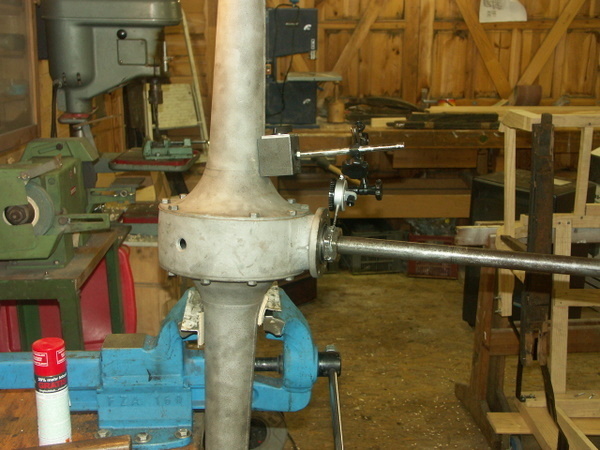 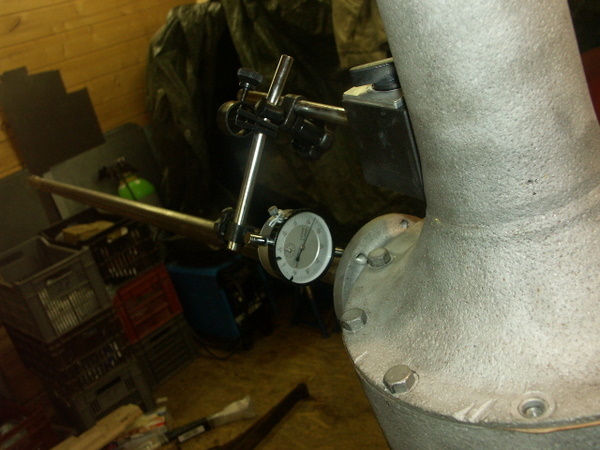 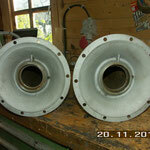 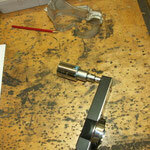 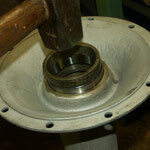 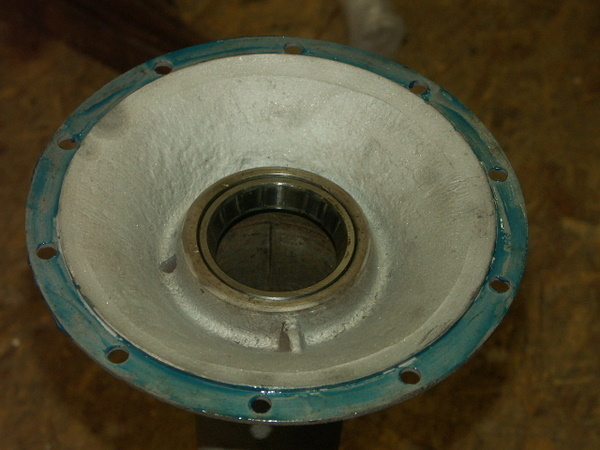 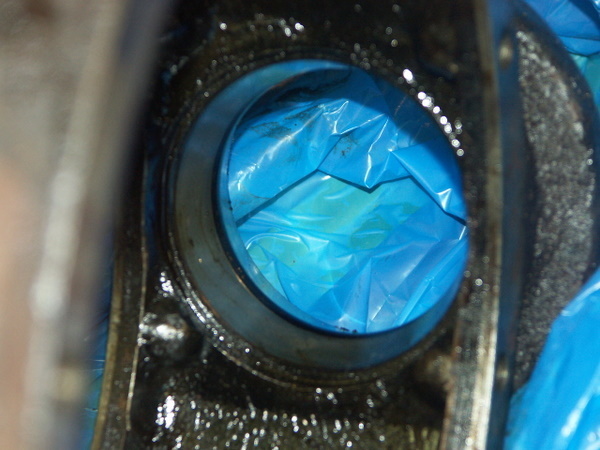 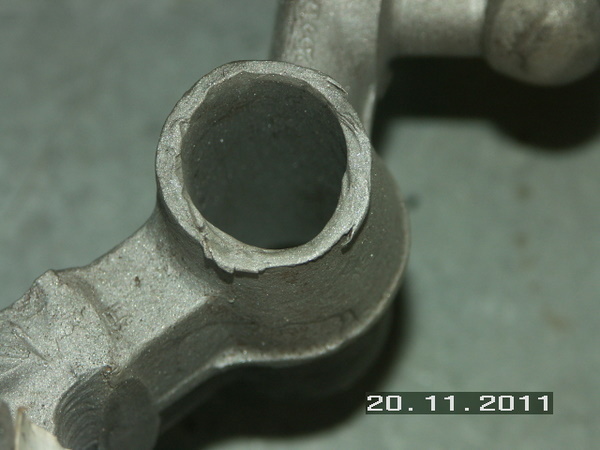 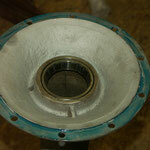 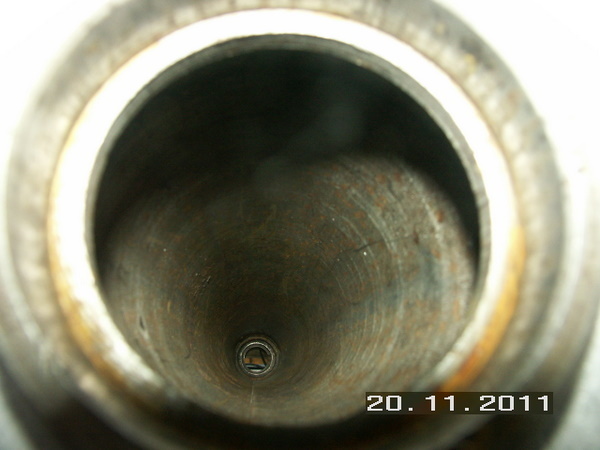 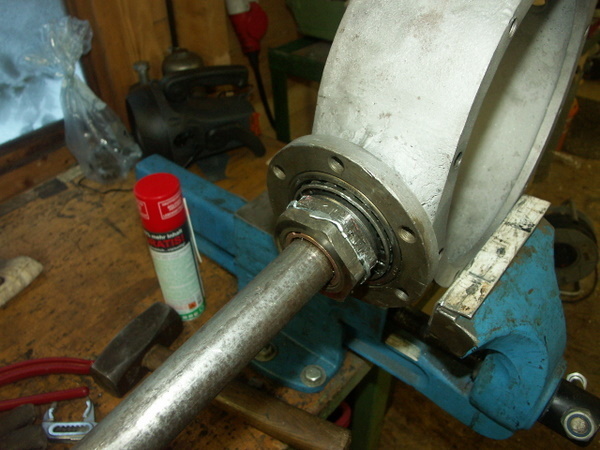 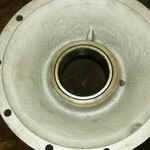 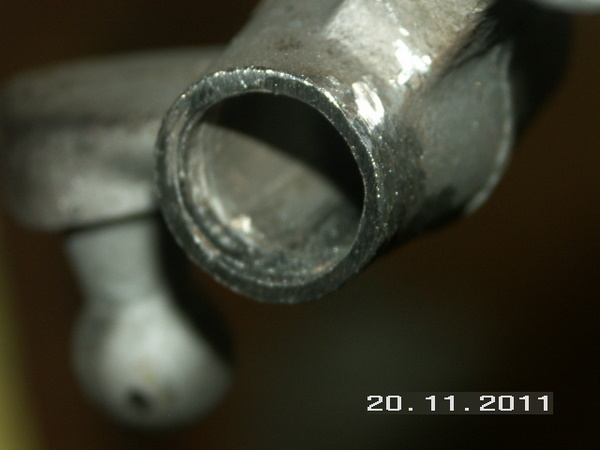 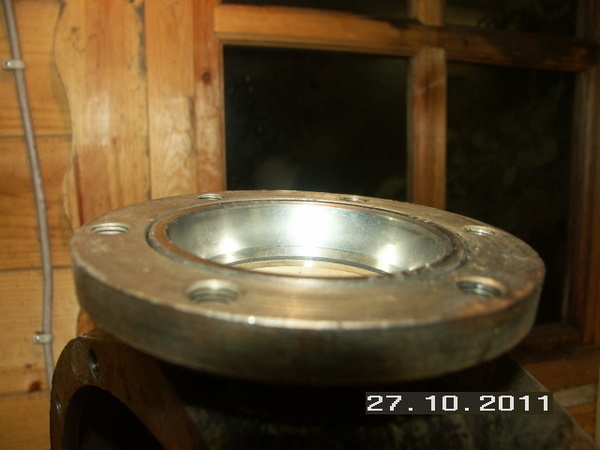 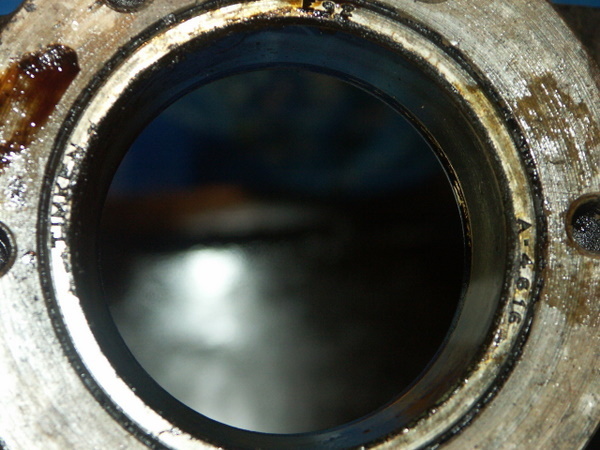 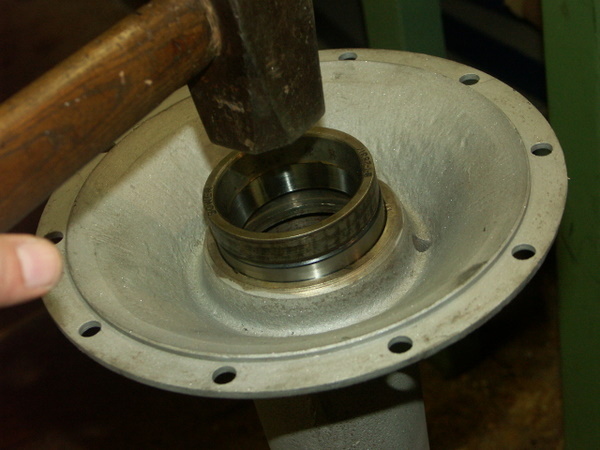 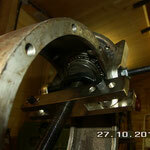 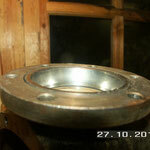 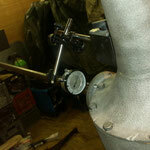 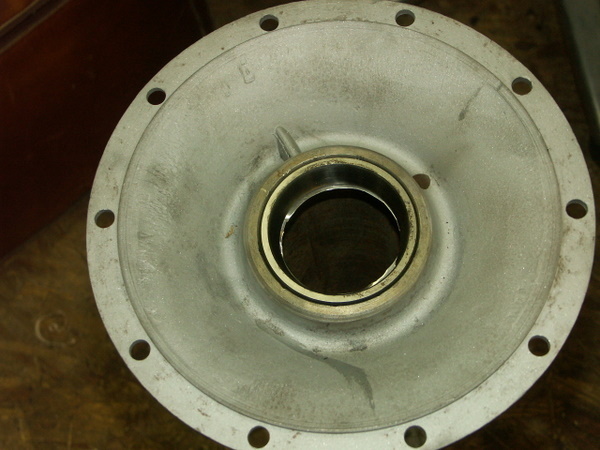 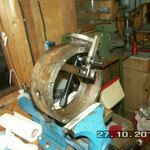 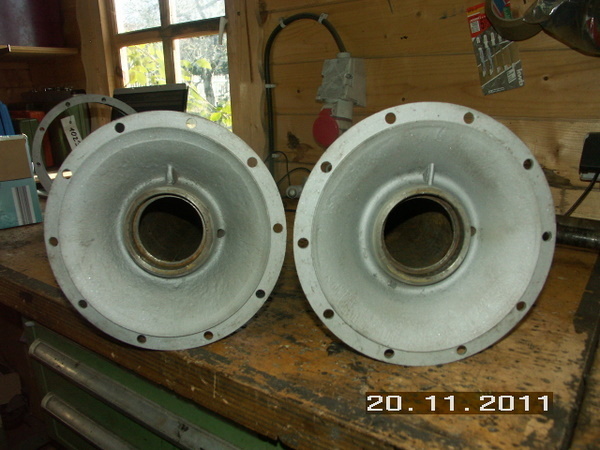 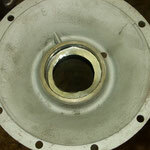 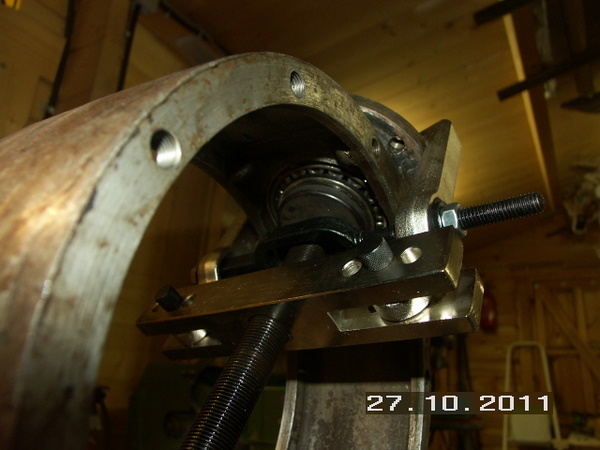 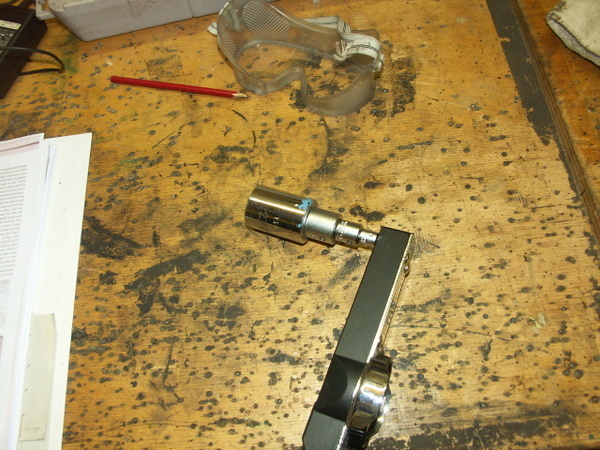 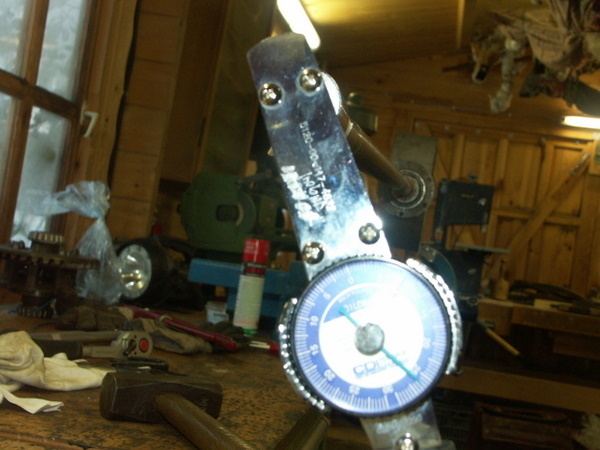 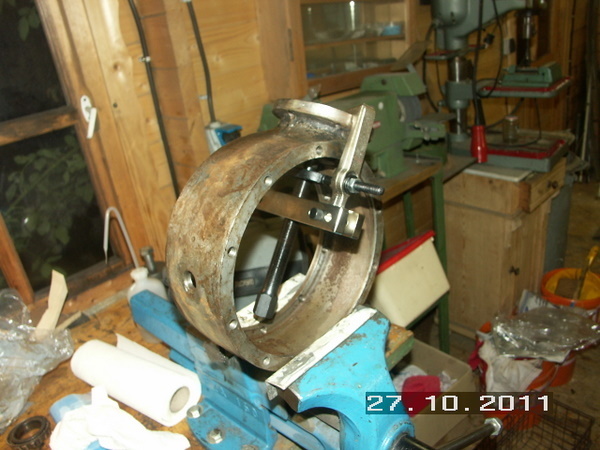 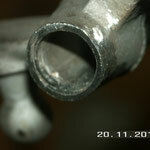 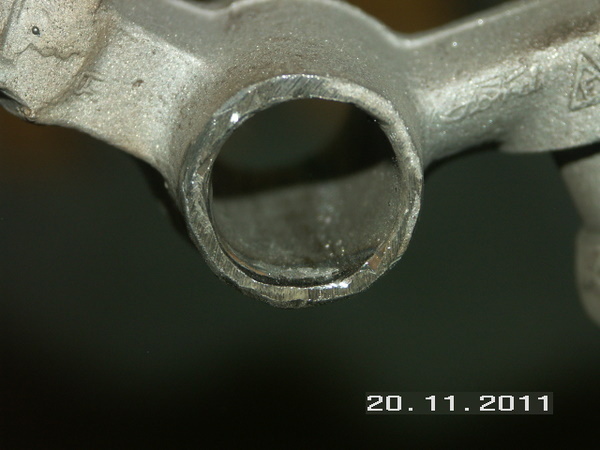 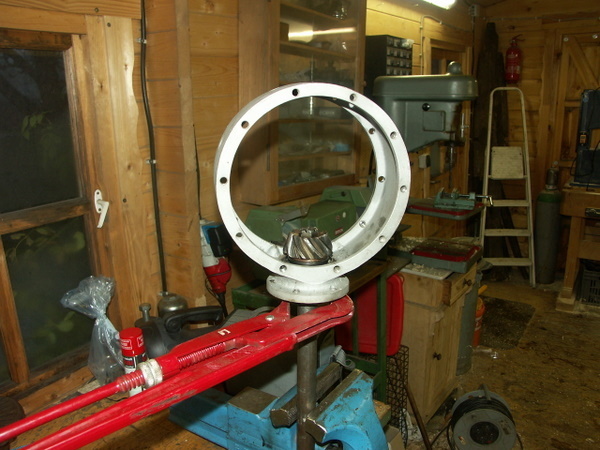 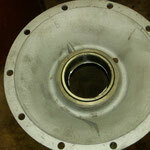 The double bearing race in the banjo housing could not be replace. 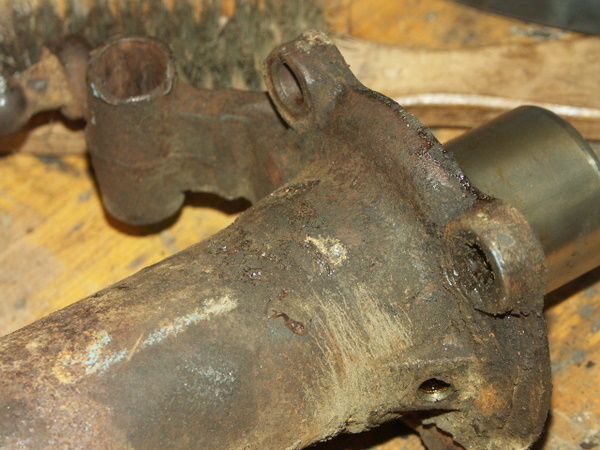 It could not be removed by any means. 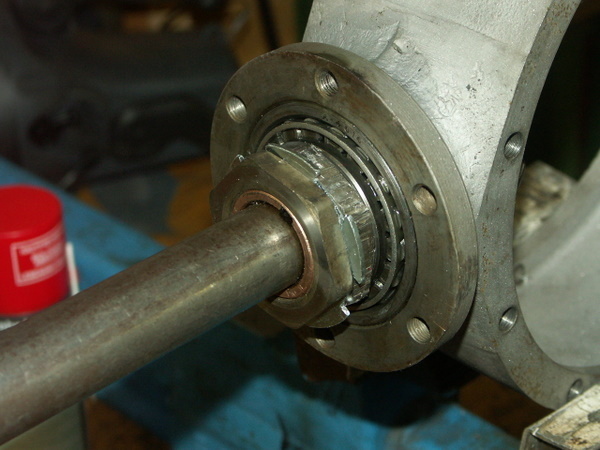 The bearing puller broke. 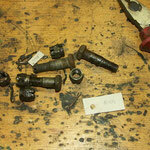 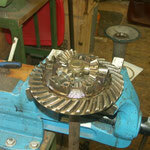 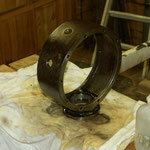 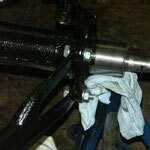 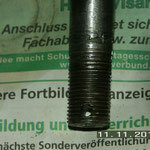 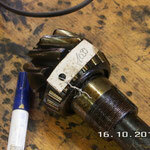 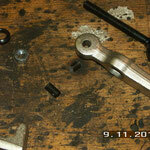 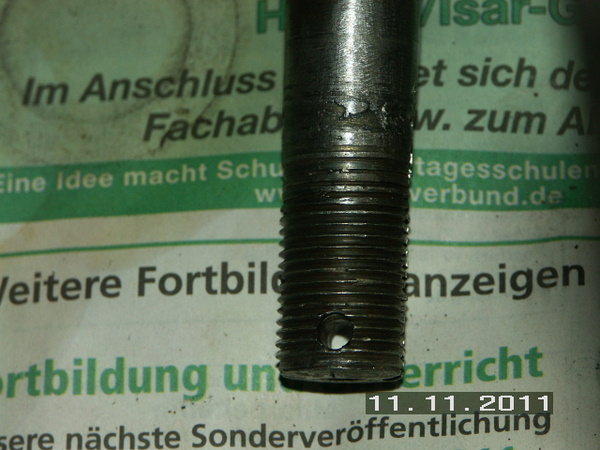 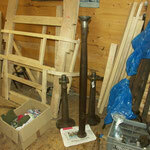 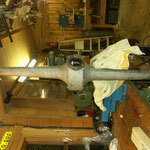 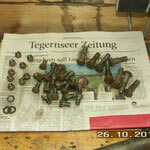 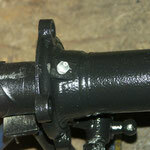 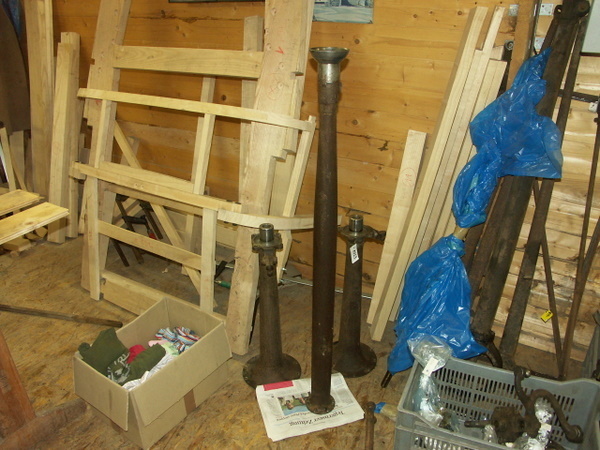 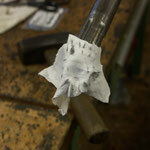 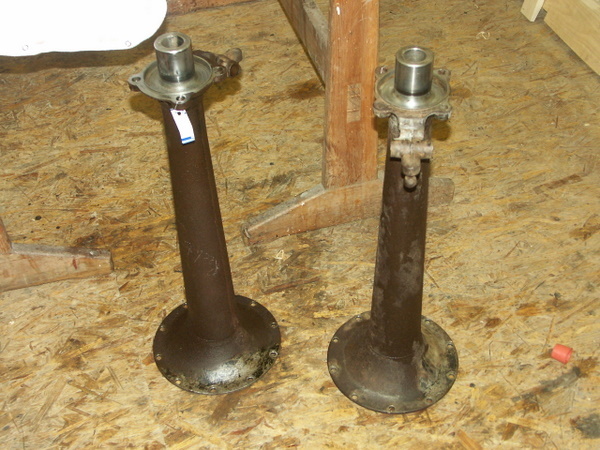 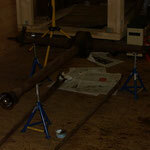 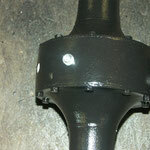 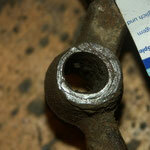 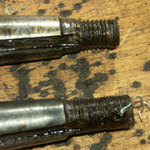 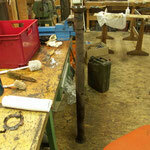 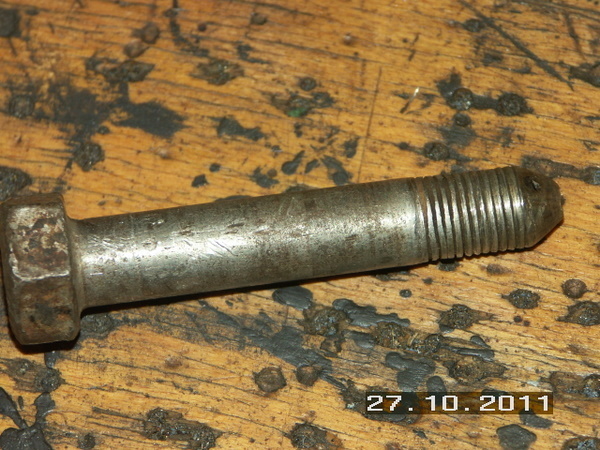 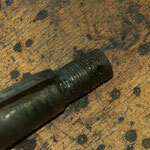 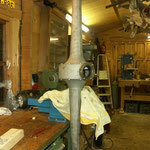 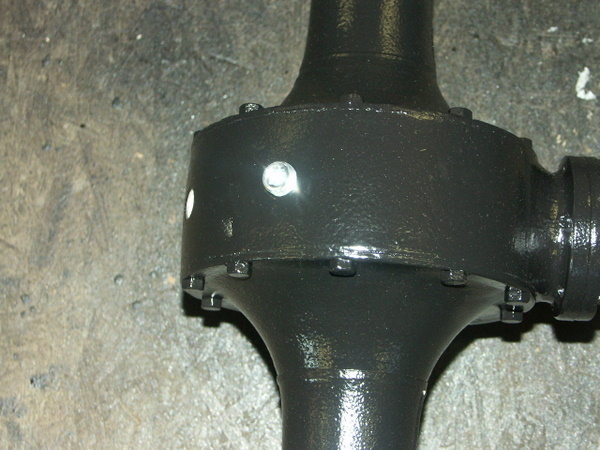 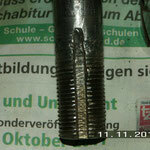 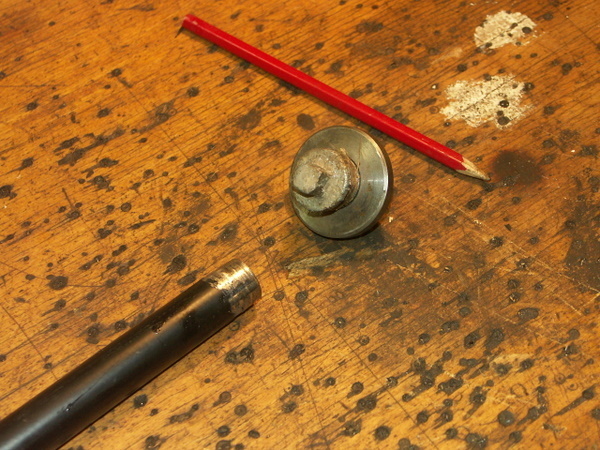 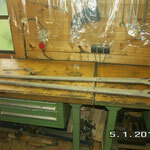 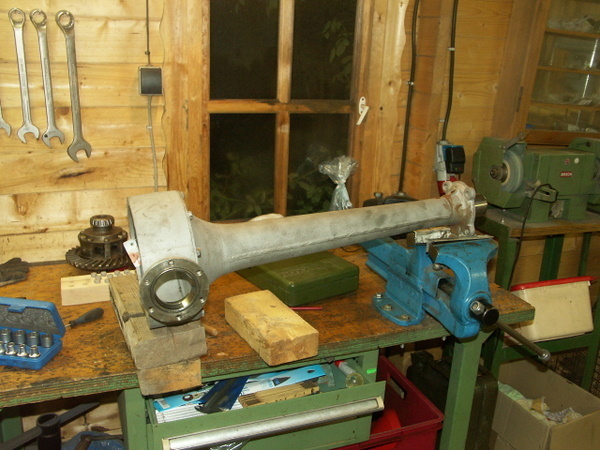 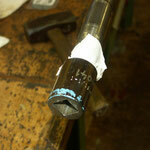 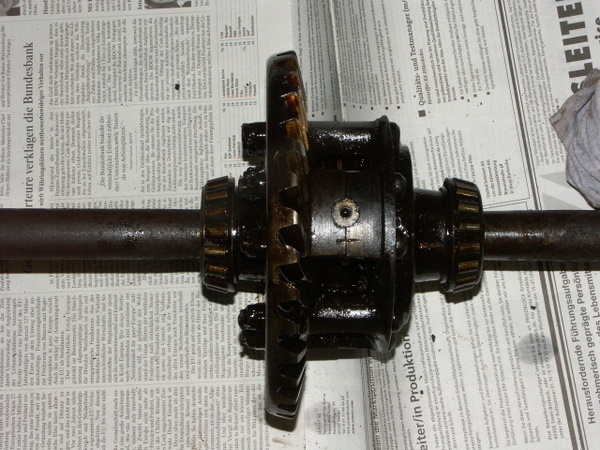 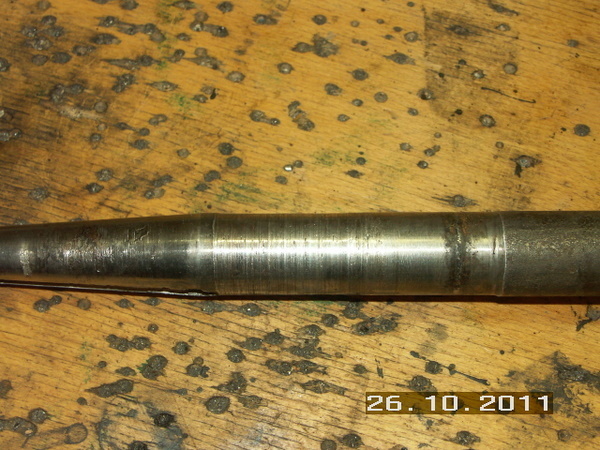 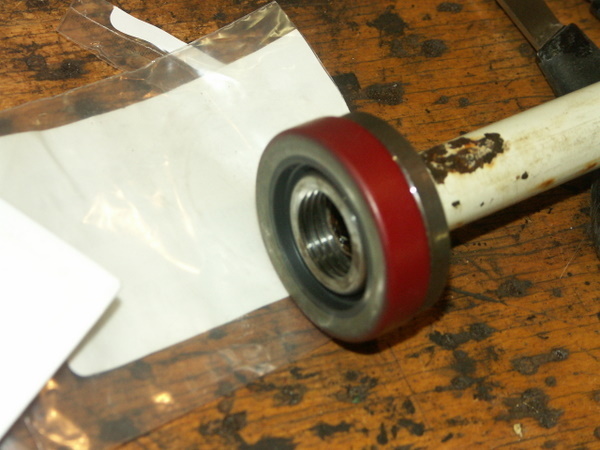 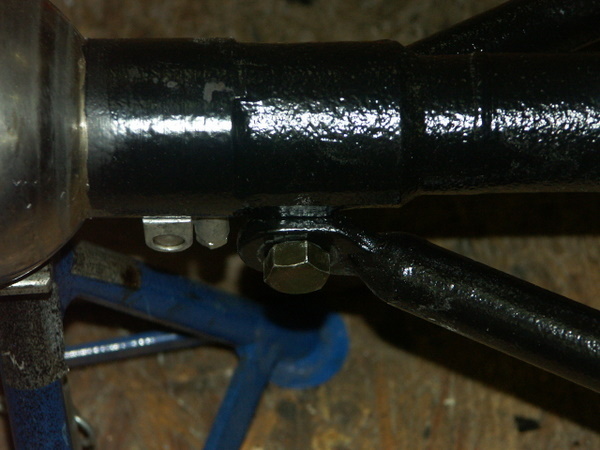 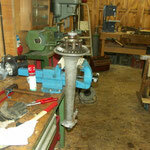 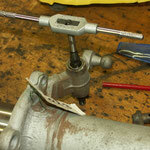 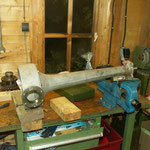 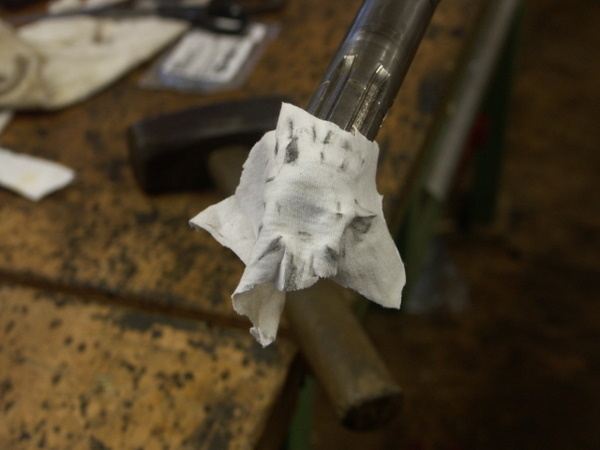 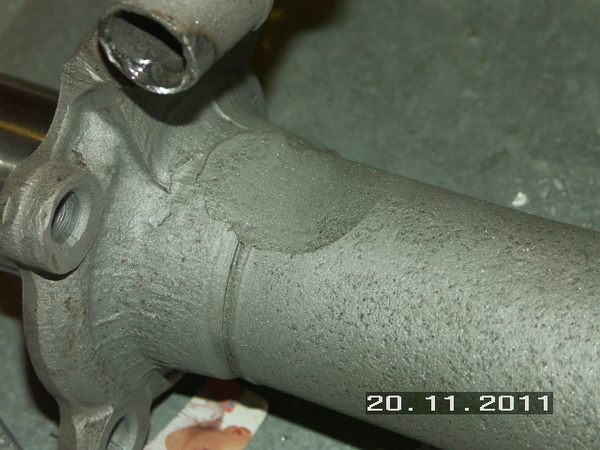 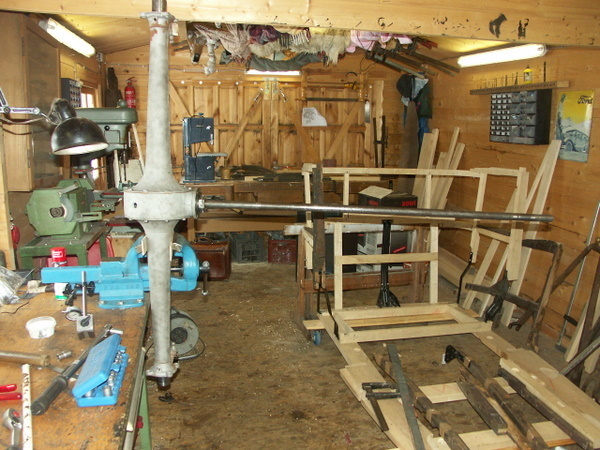 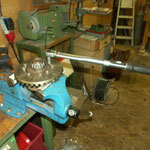 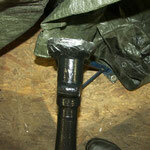 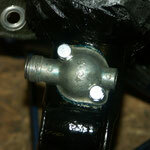 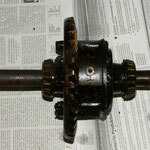 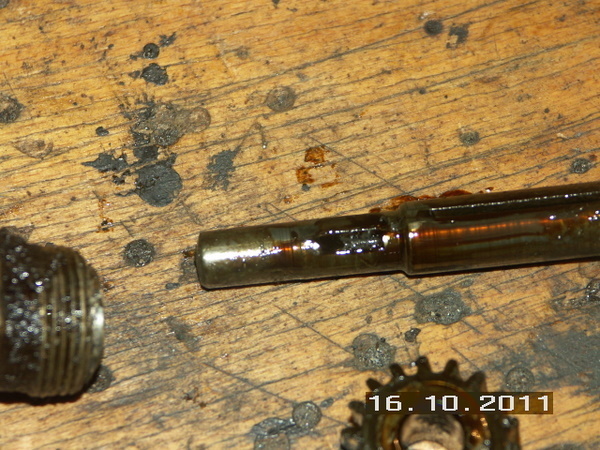 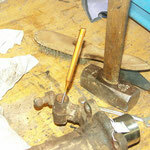 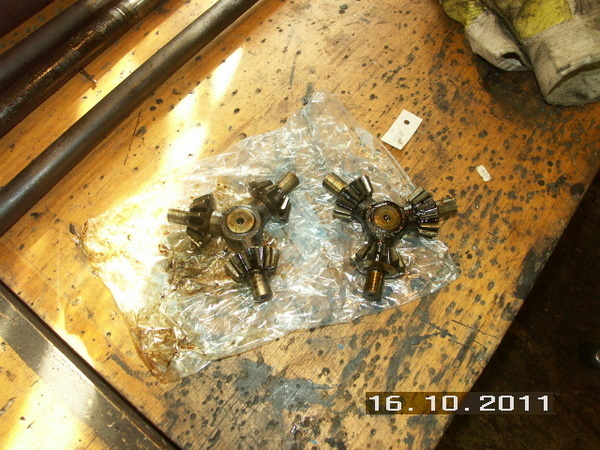 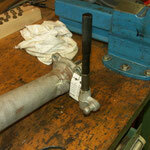 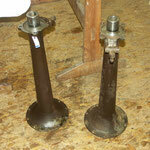 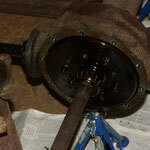 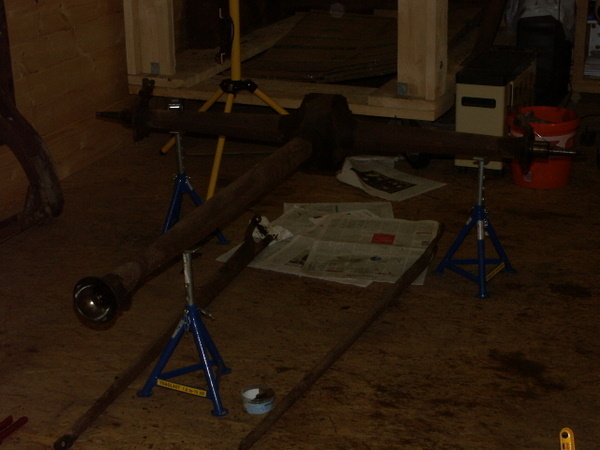 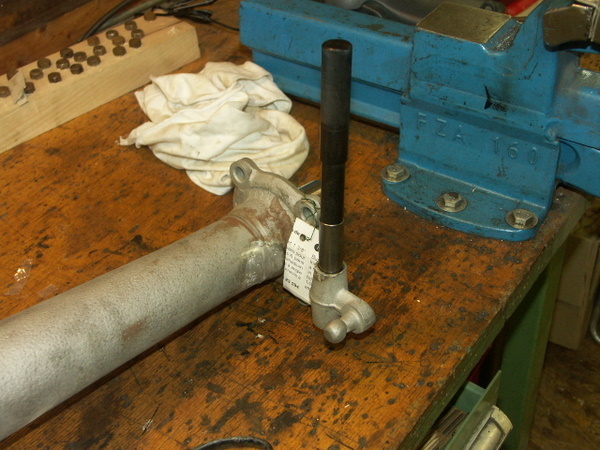 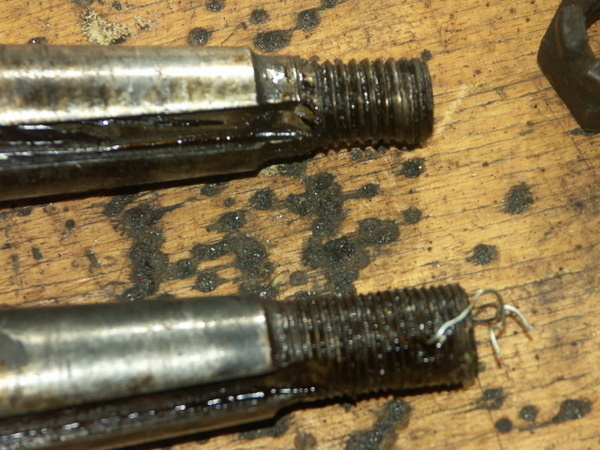 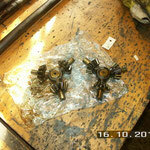 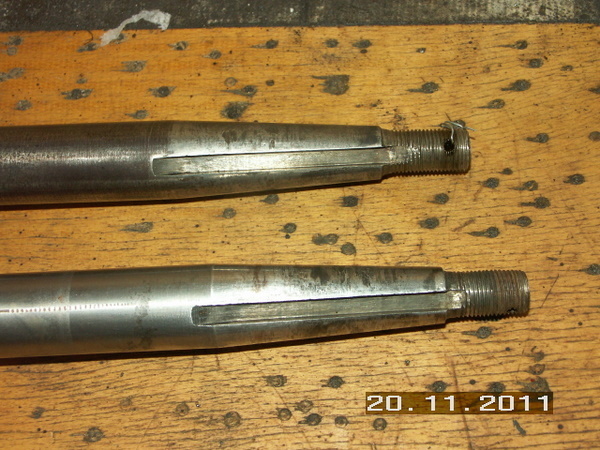 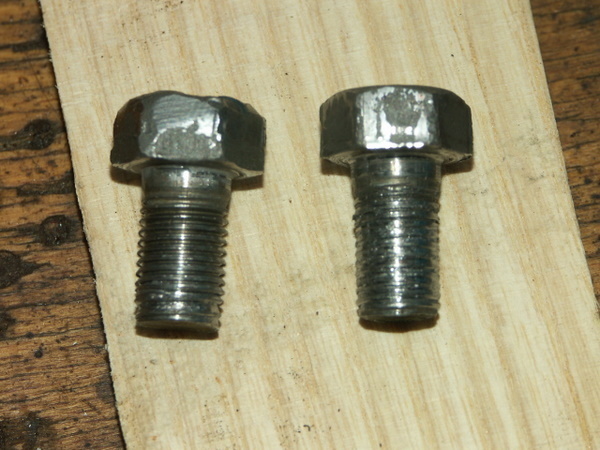 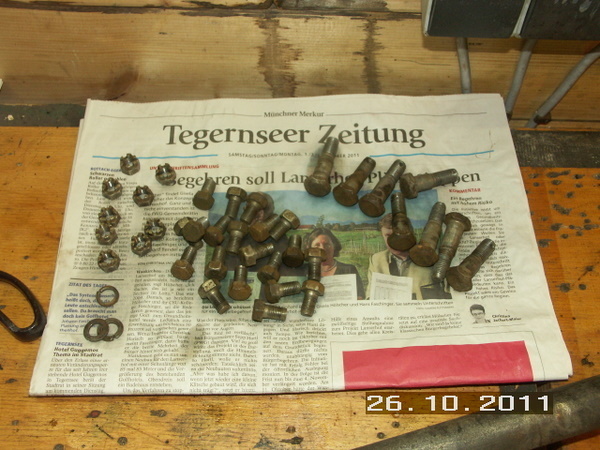 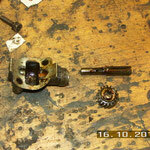 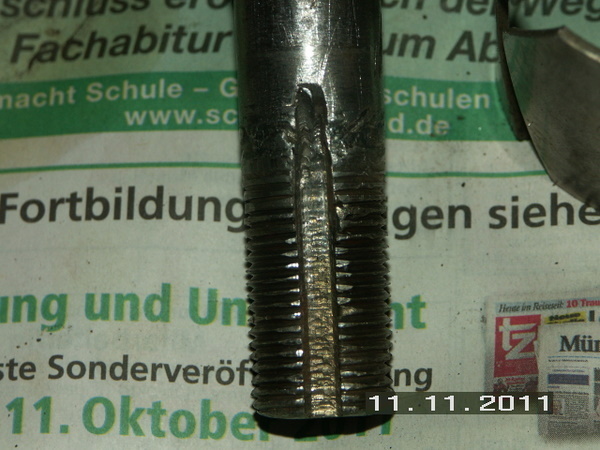 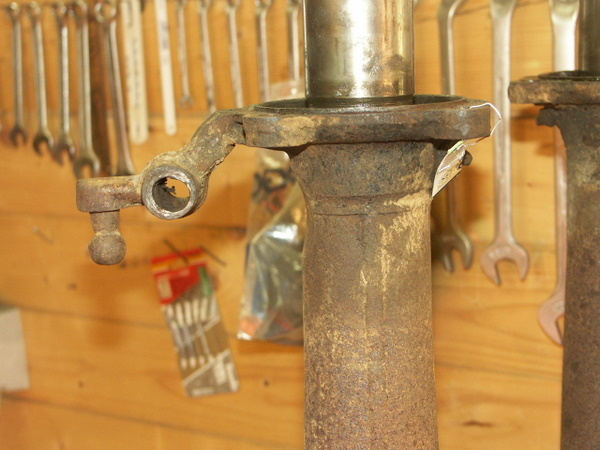 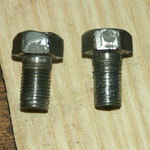 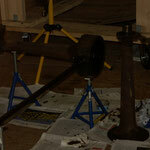 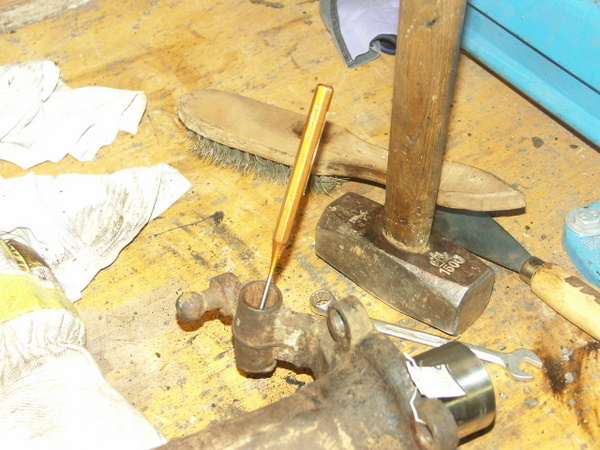 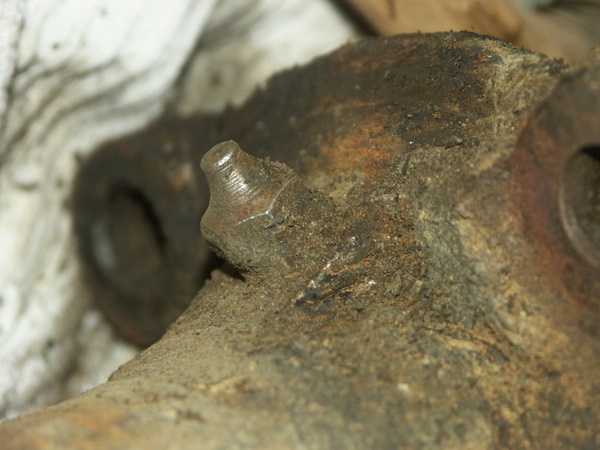 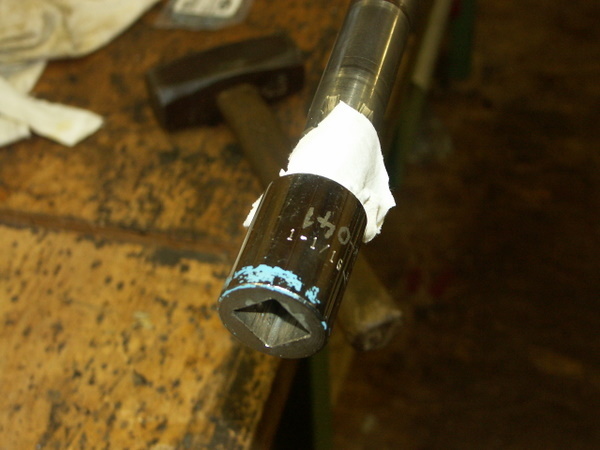 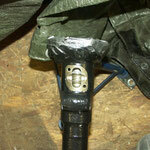 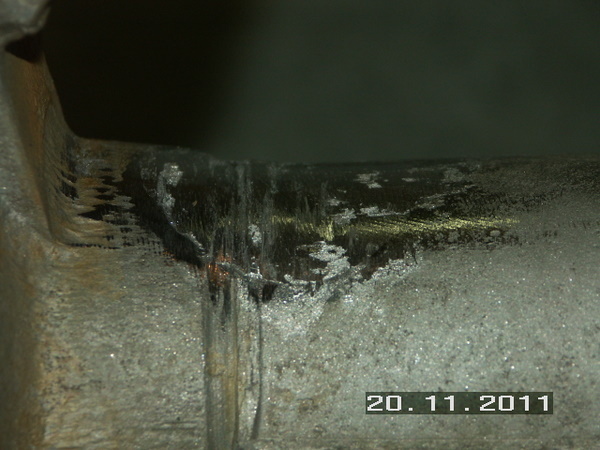 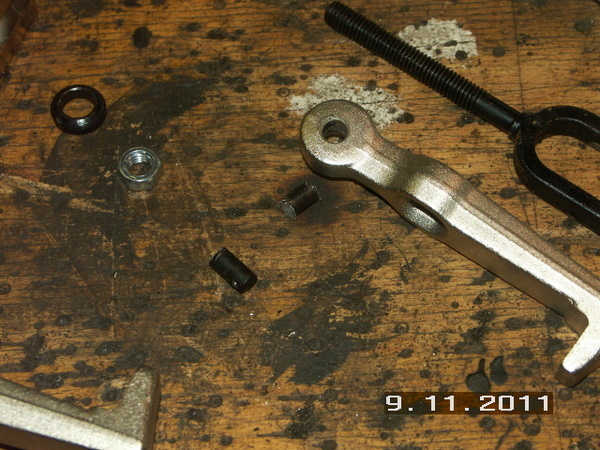 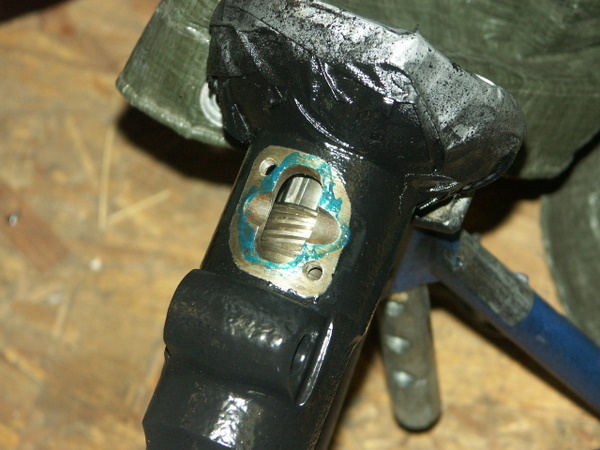 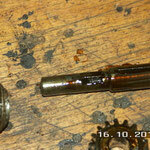 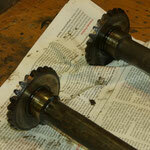 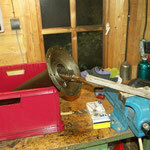 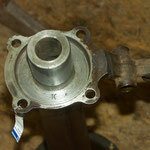 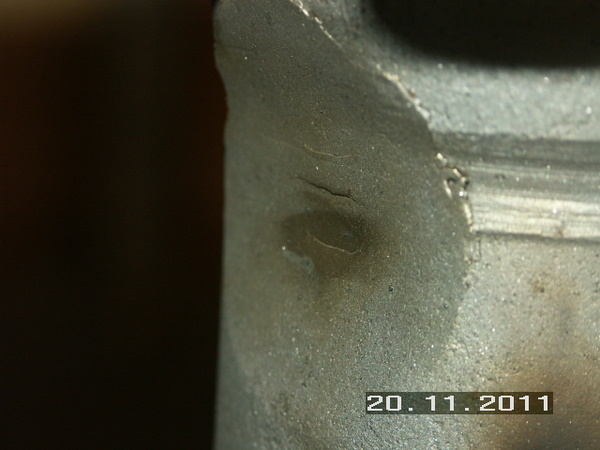 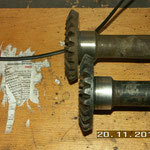 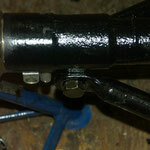 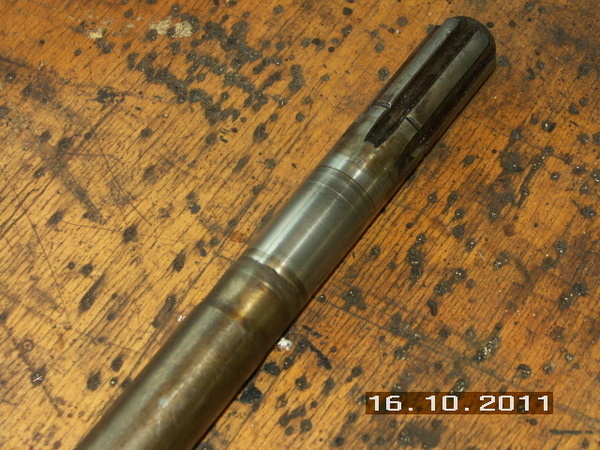 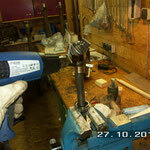 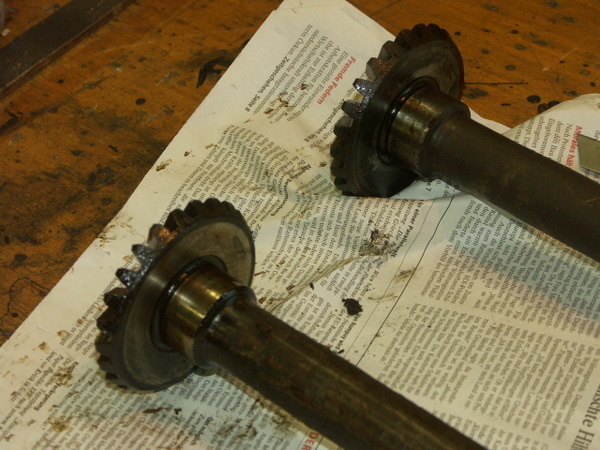 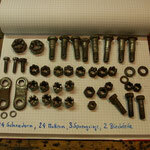 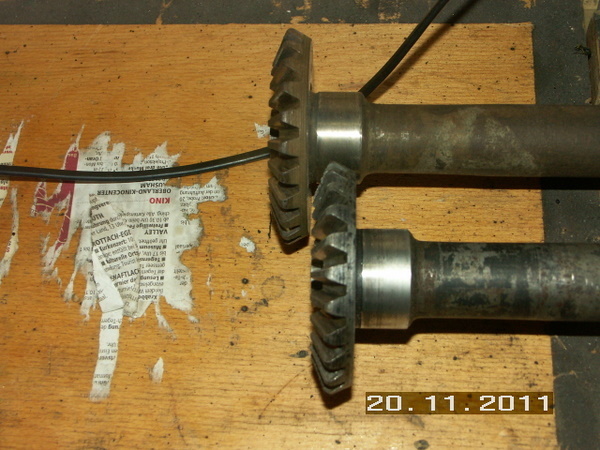 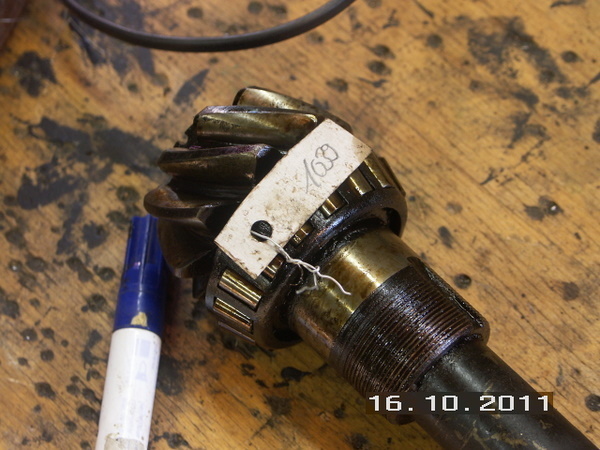 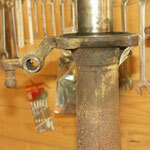 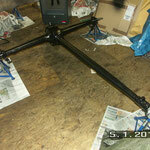 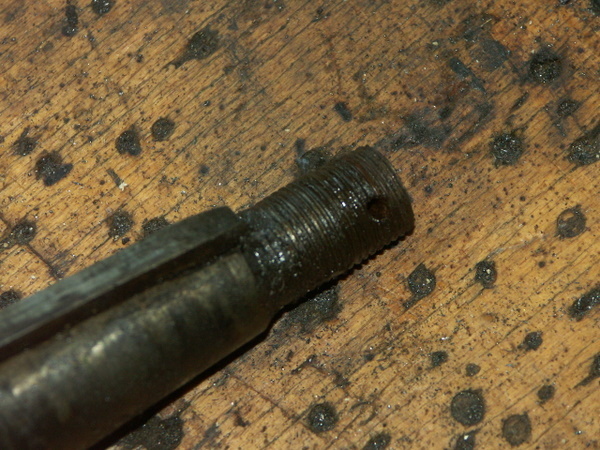 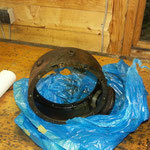 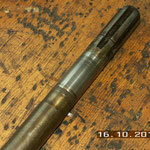 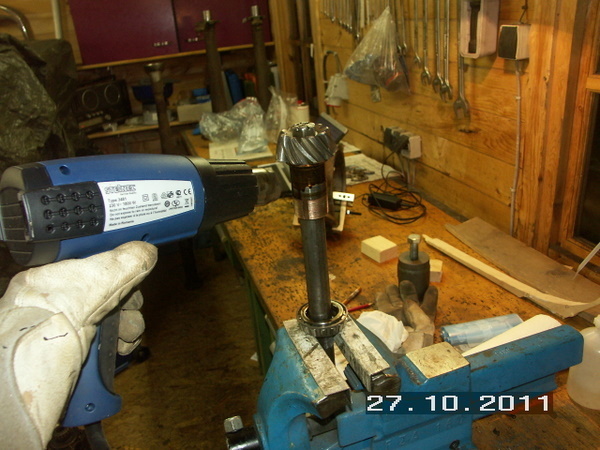 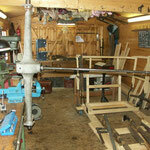 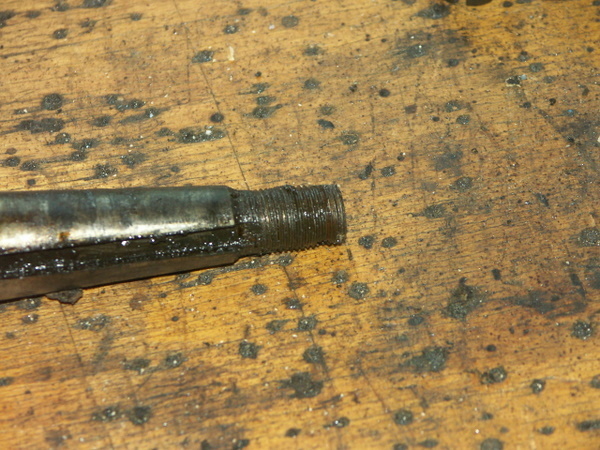 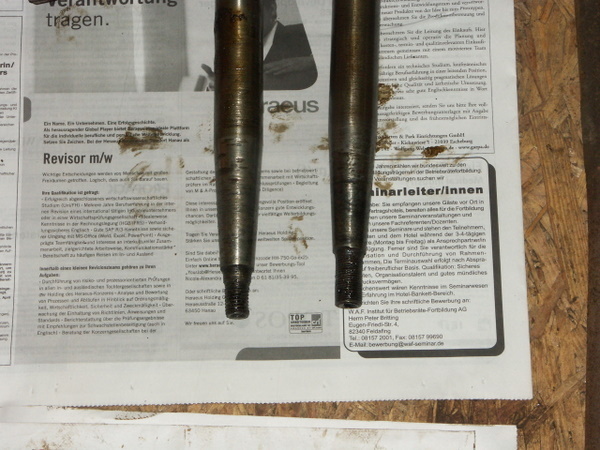 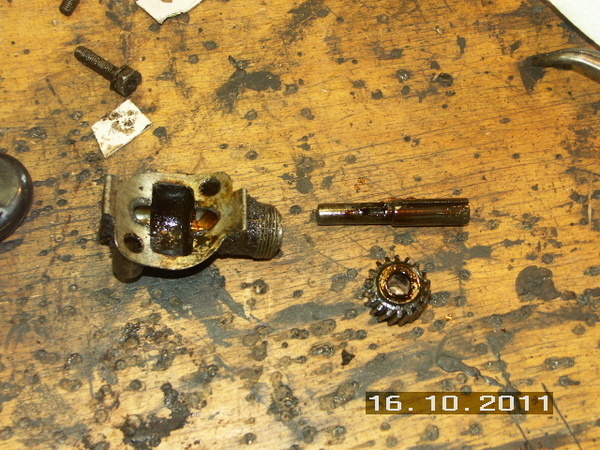 One of the axles had to be replaced with an original one, as the threads were obviously treated. 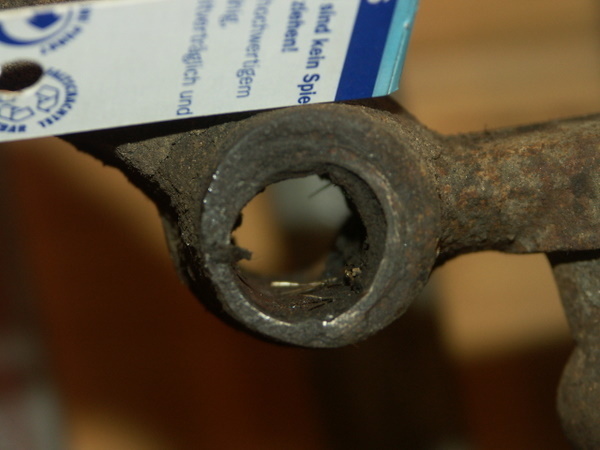 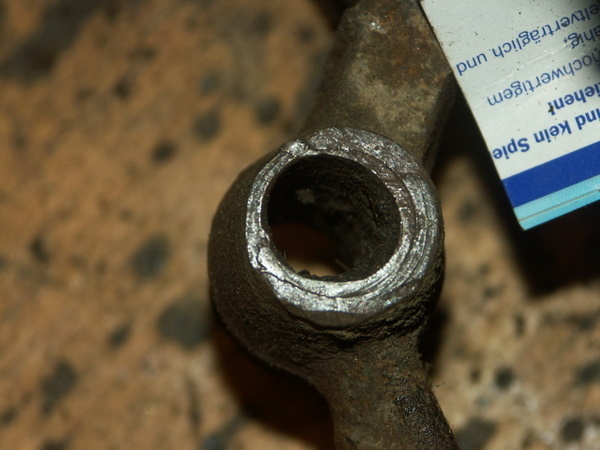 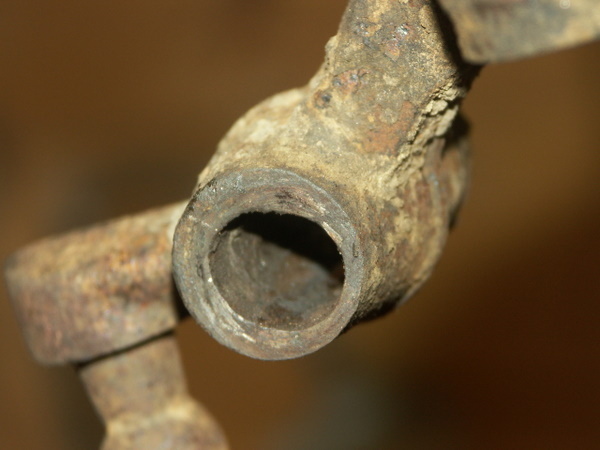 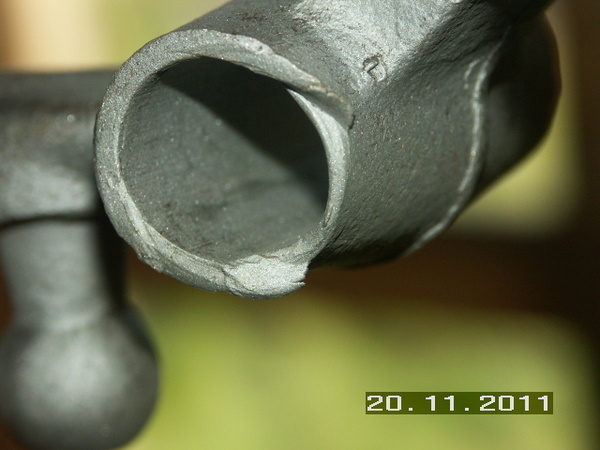 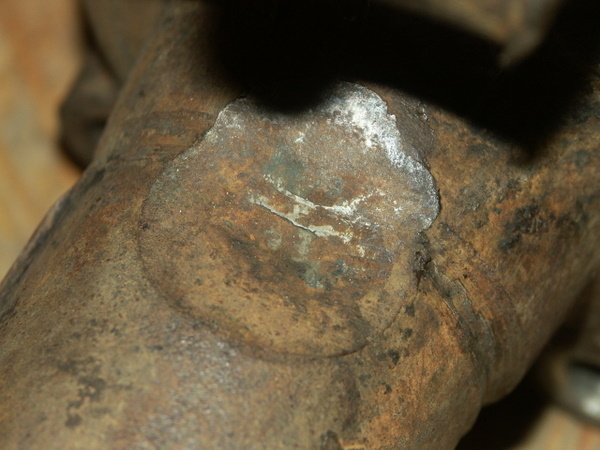 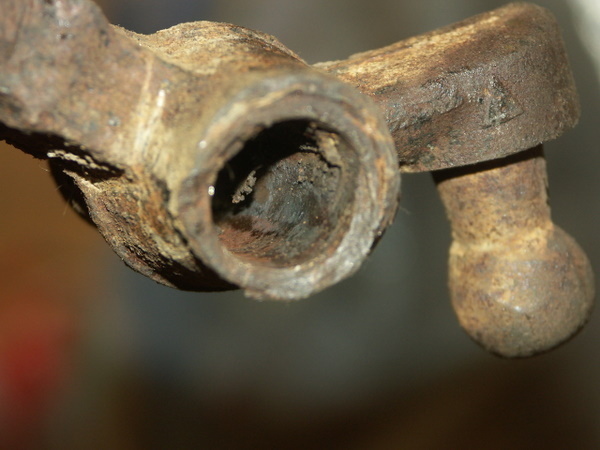 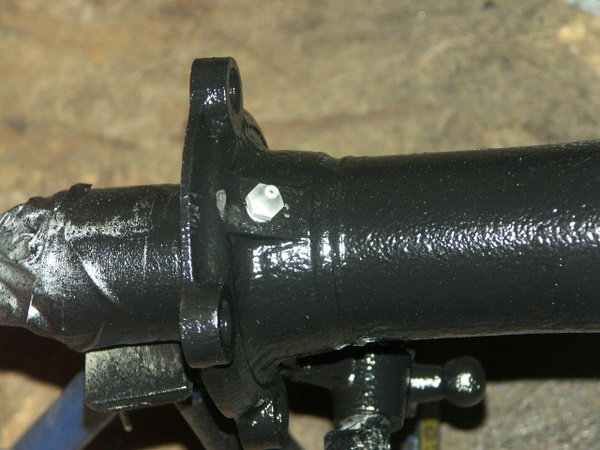 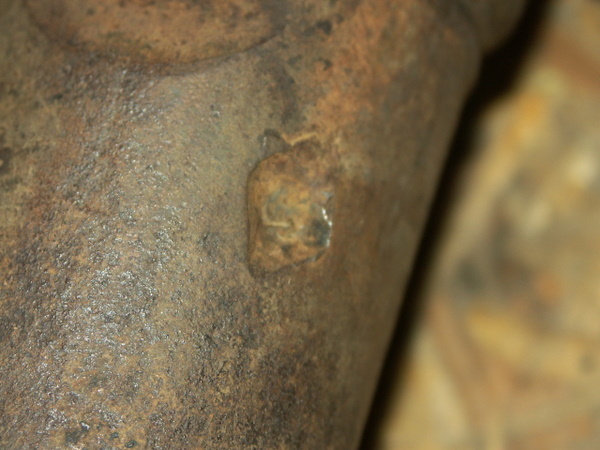 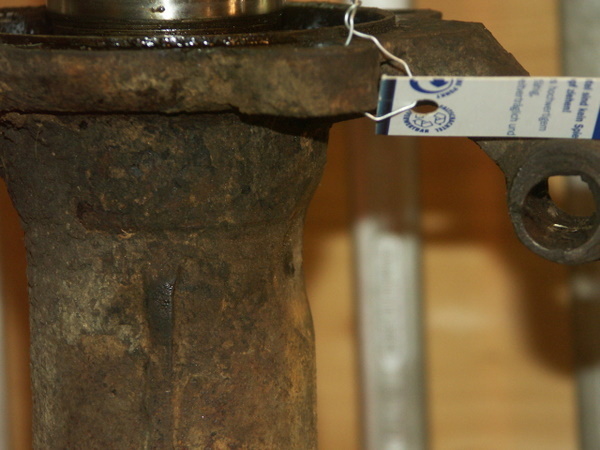 The axle housings had some worne parts just below the spring shackles, were the spring (not original, see there) touched the axles housings. 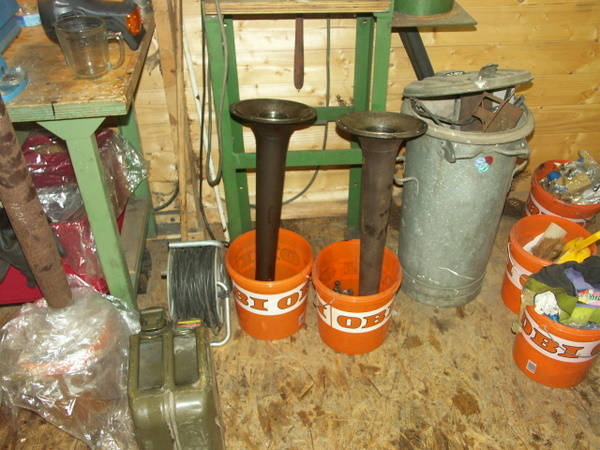 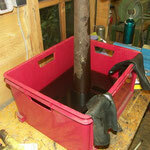 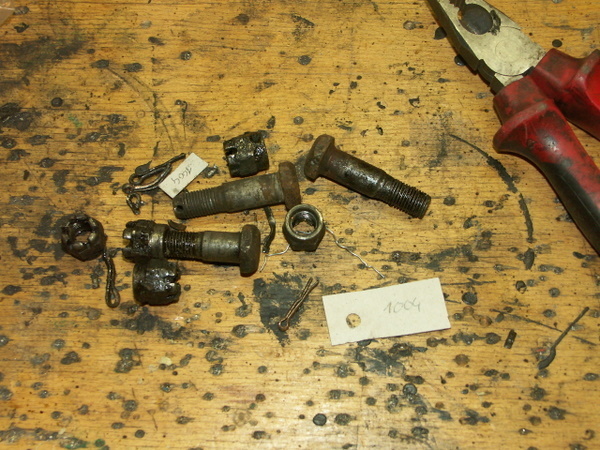 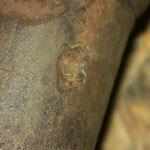 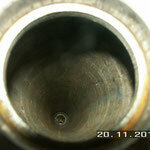 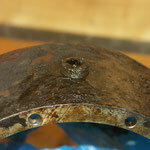 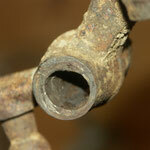 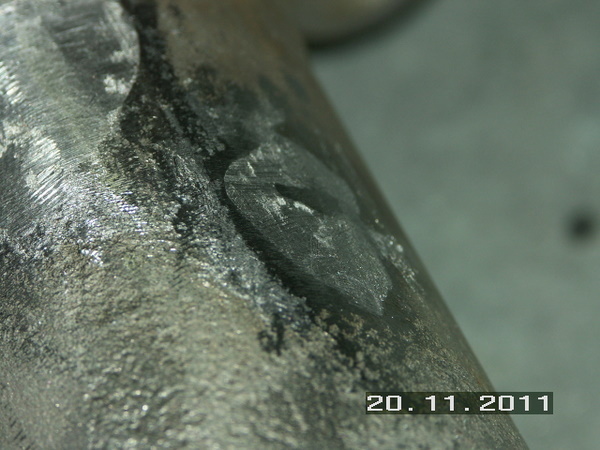 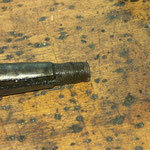 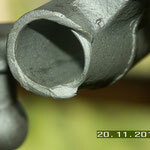 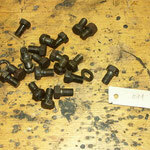 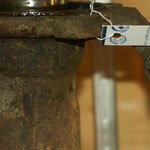 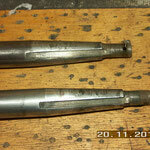 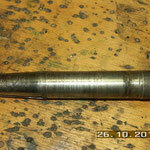 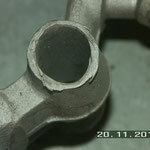 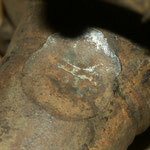 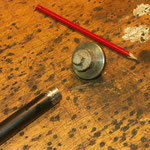 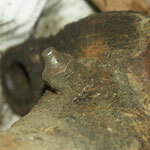 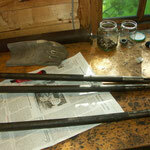 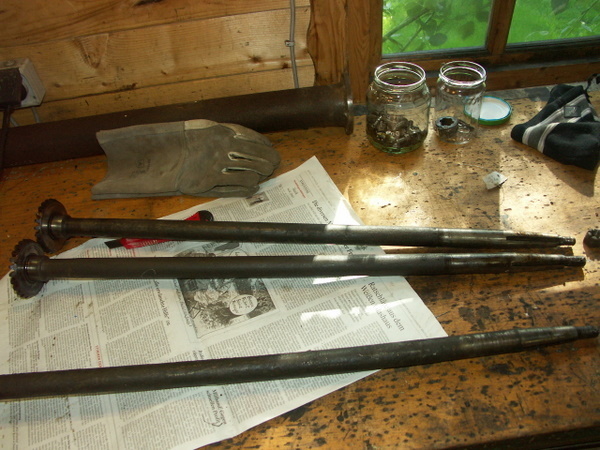 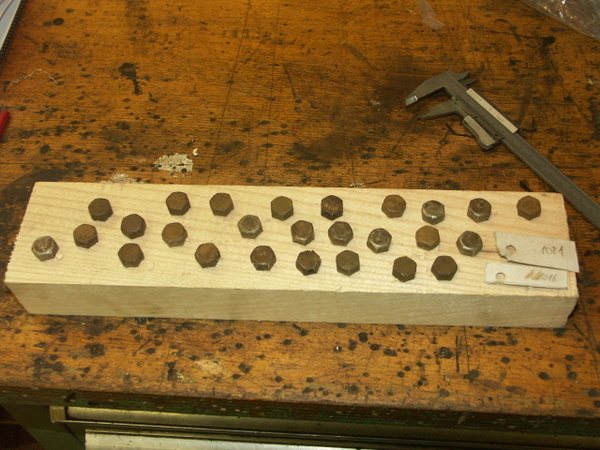 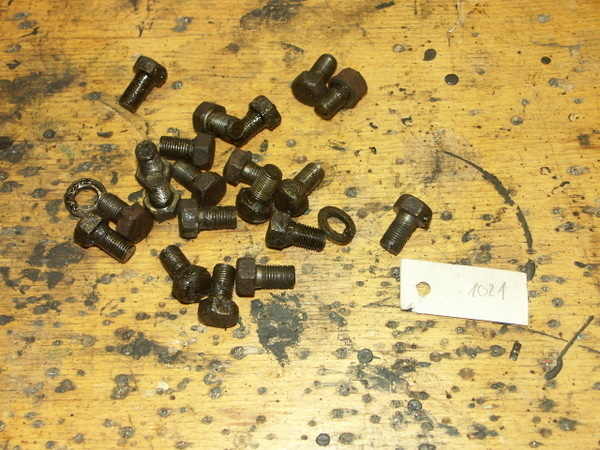 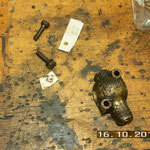 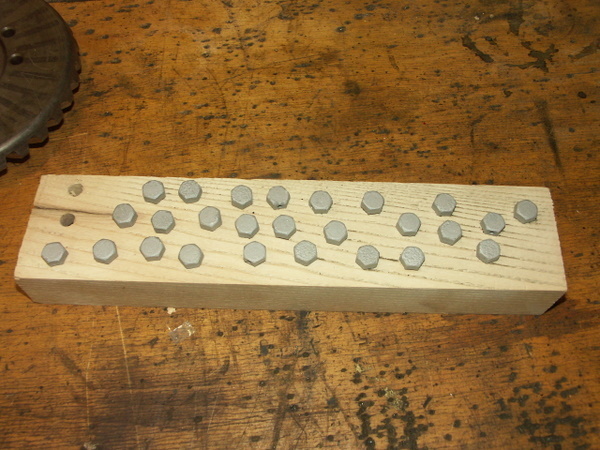 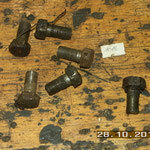 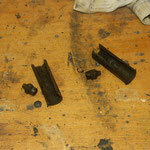 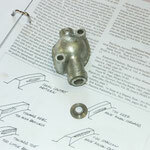 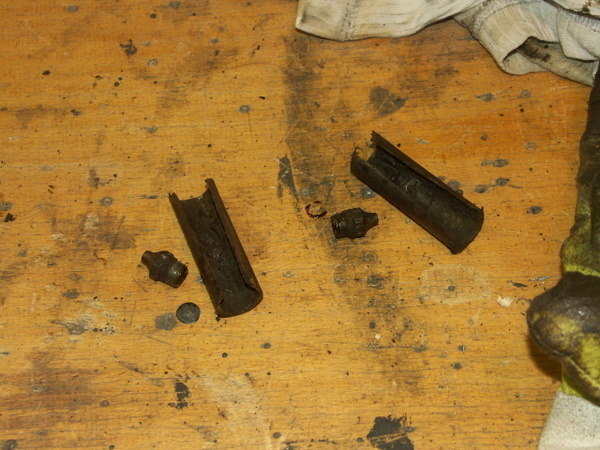 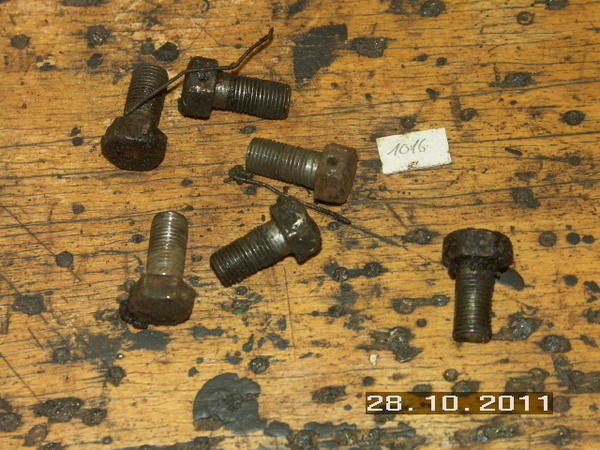 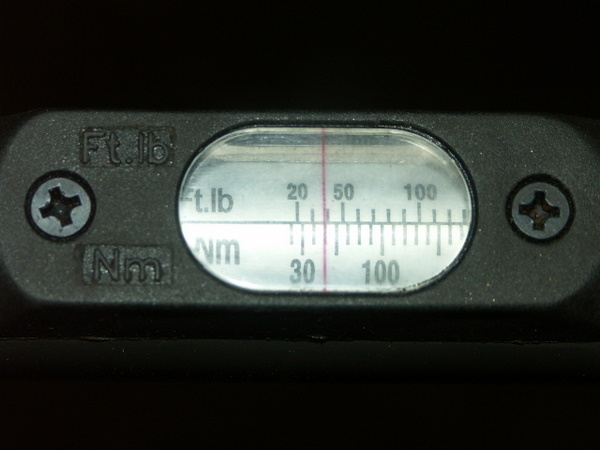 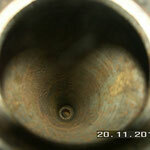 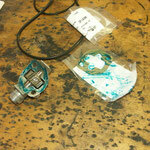 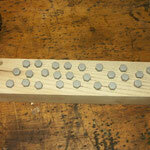 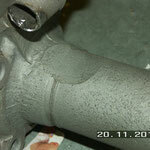 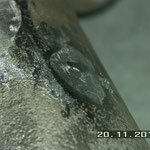 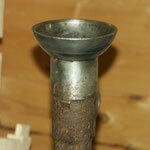 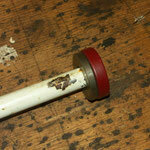 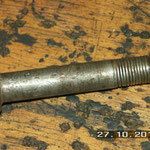 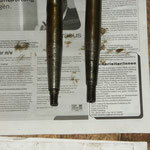 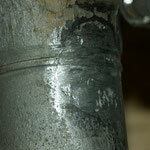 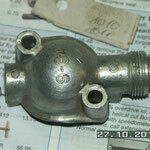 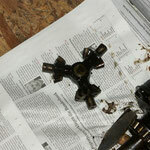 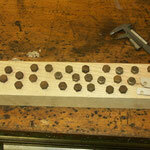 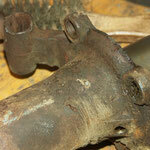 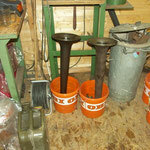 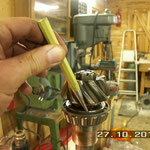 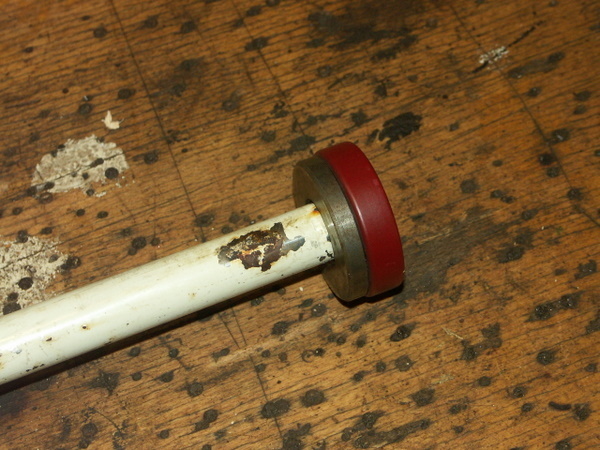 These worne parts were filled up with tin/lead mixture. 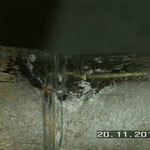 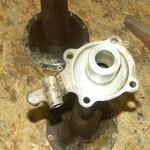 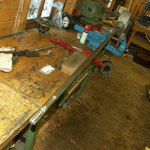 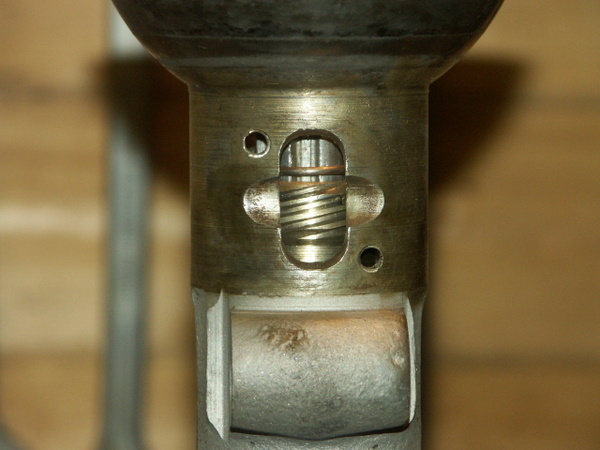 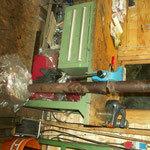 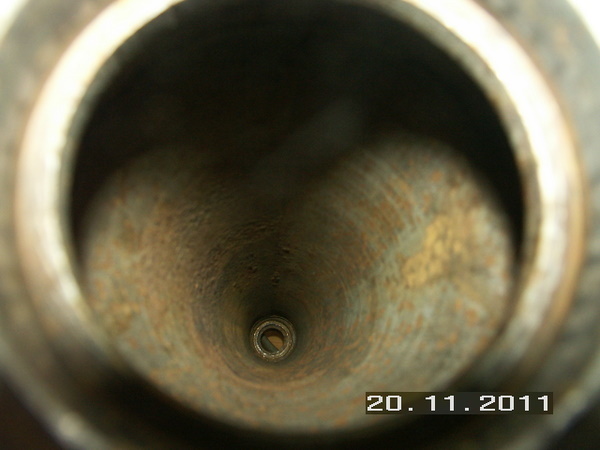 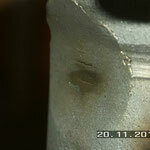 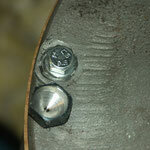 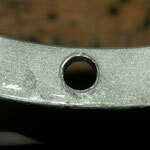 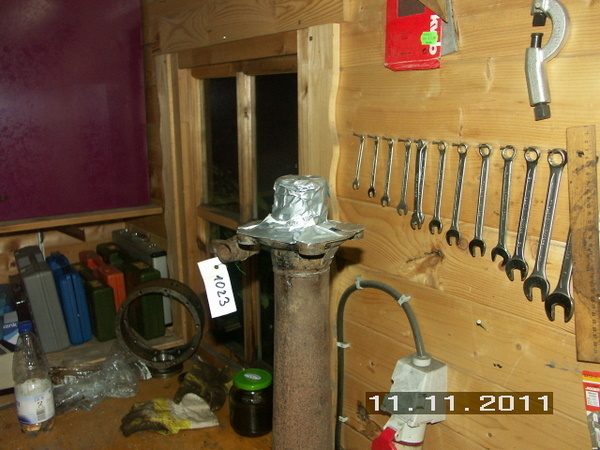 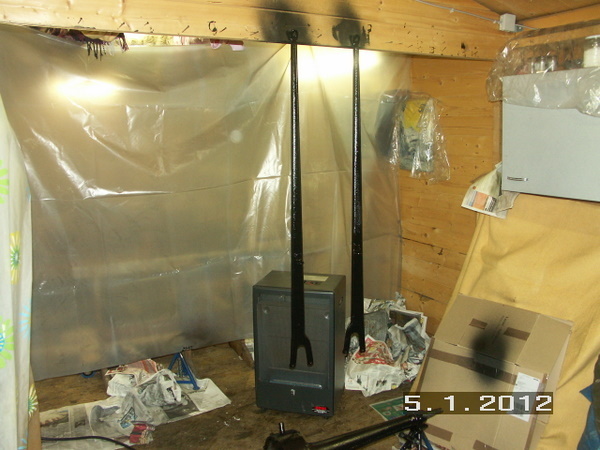 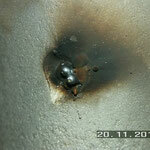 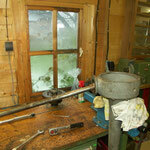 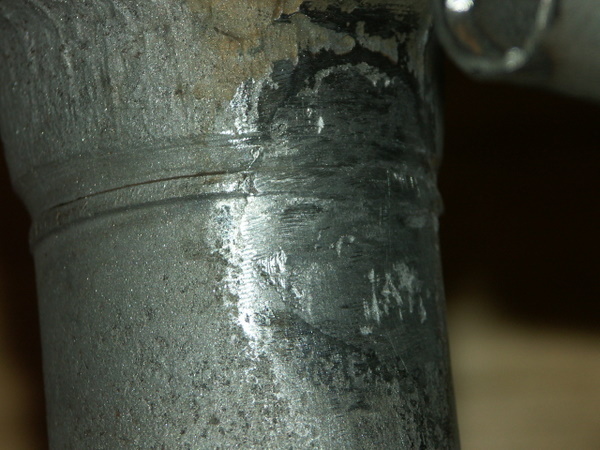 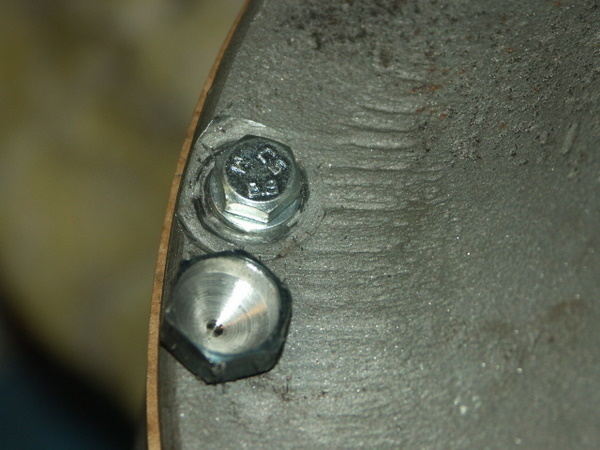 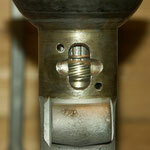 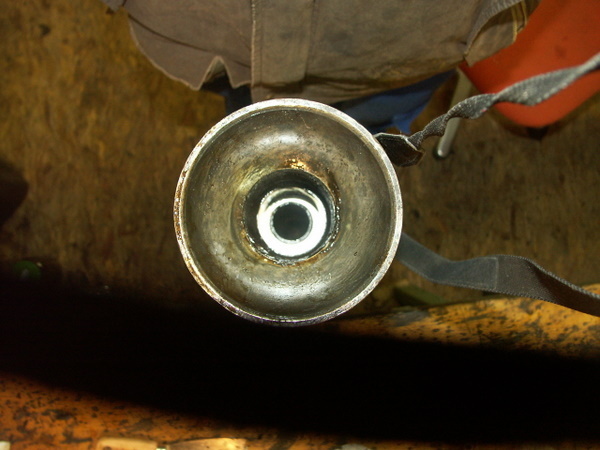 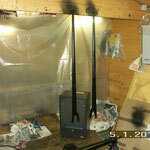 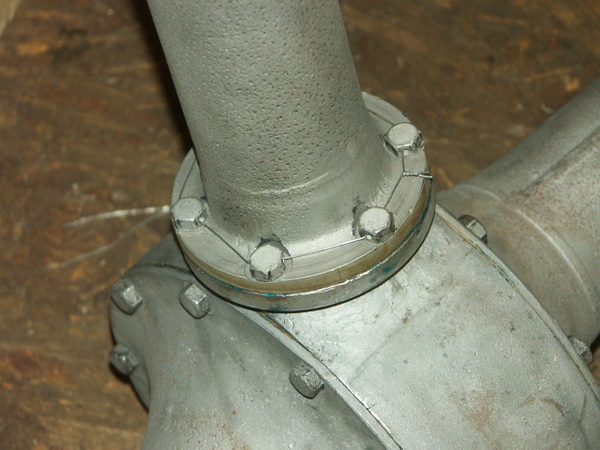 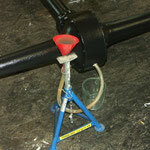 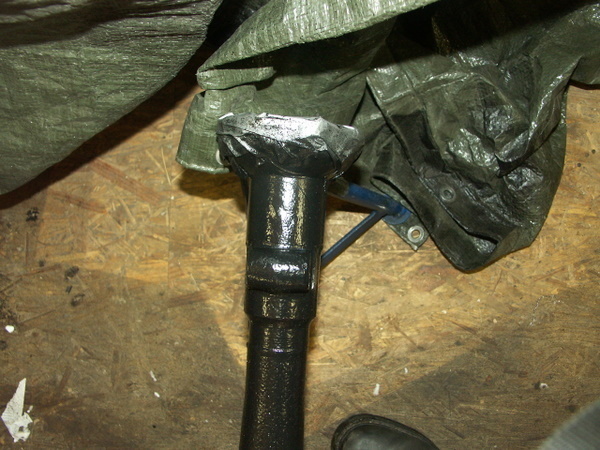 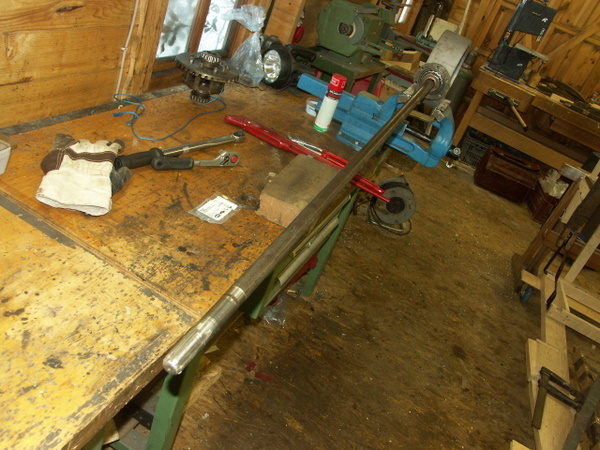 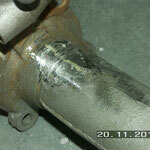 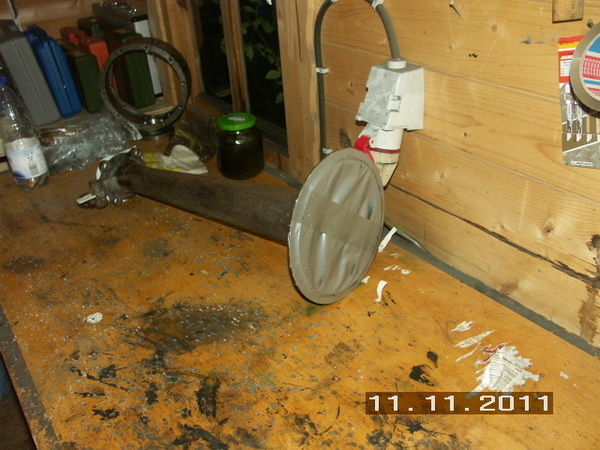 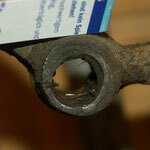 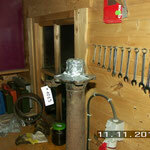 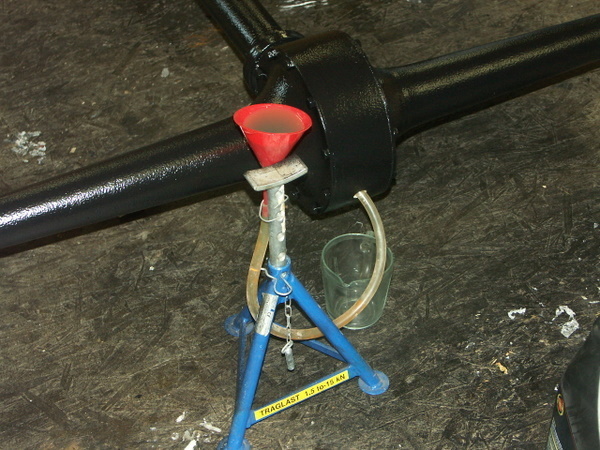 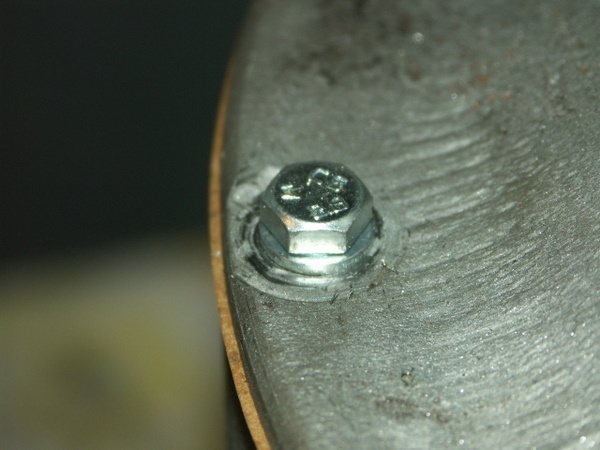 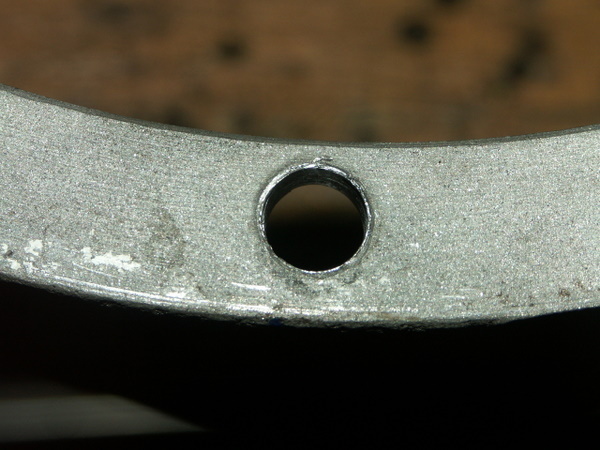 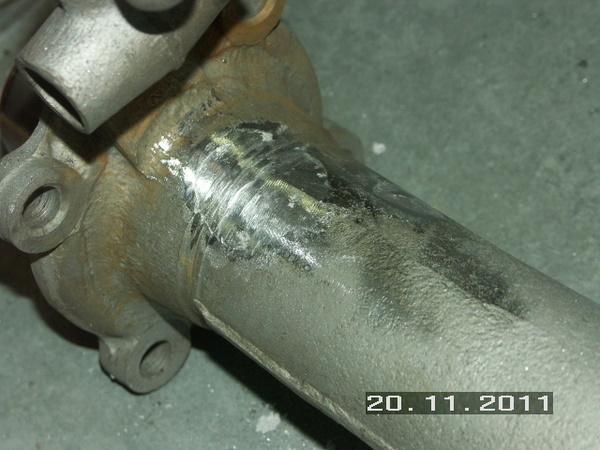 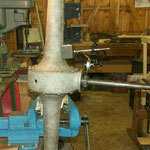 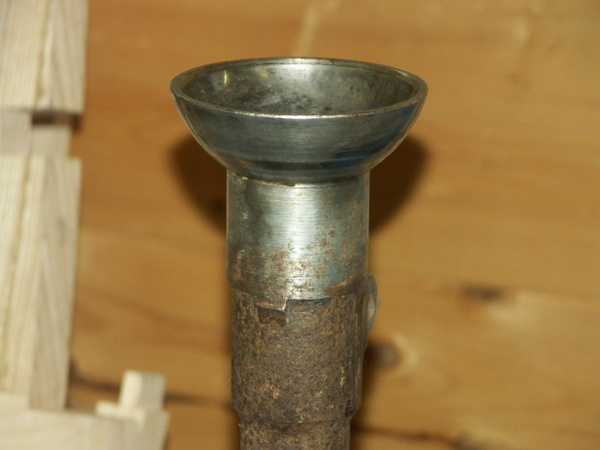 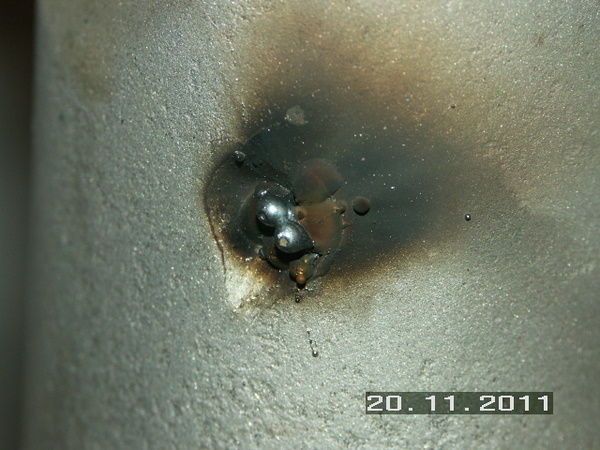 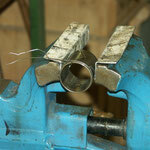 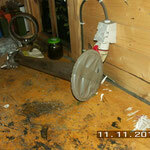 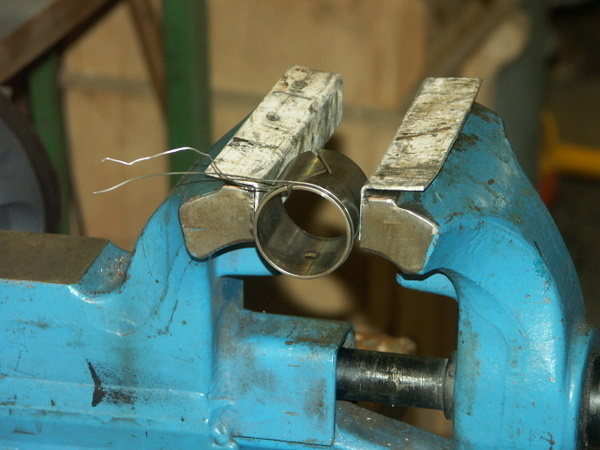 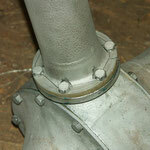 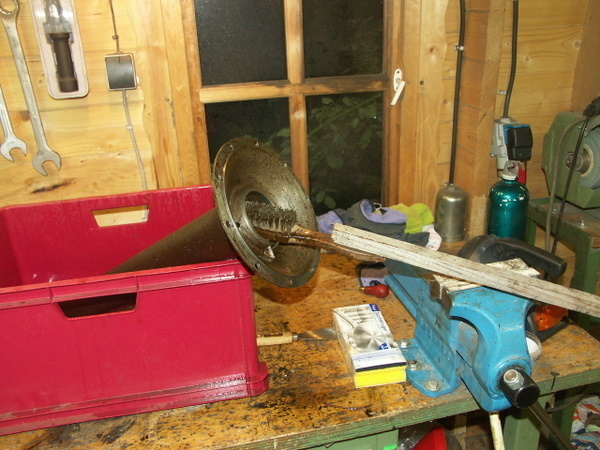 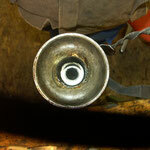 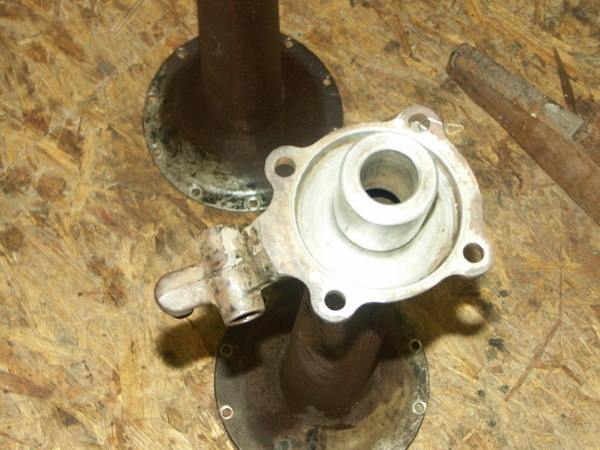 A hole in the housing was welded, and the spring perches were welded up back to size. 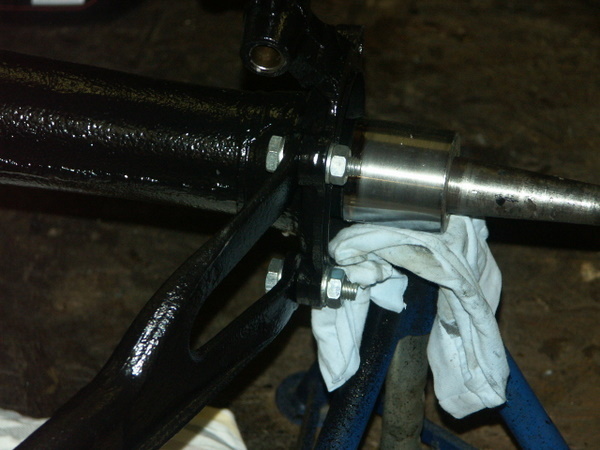 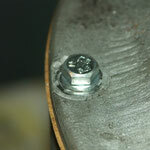 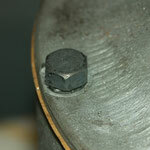 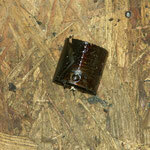 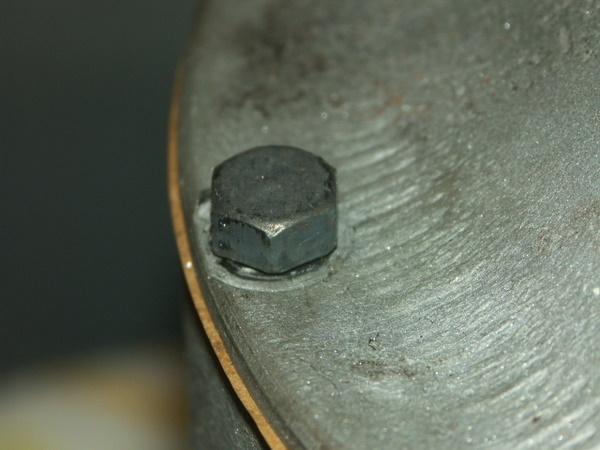 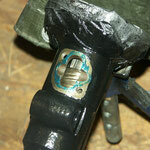 Bushings were replaced. 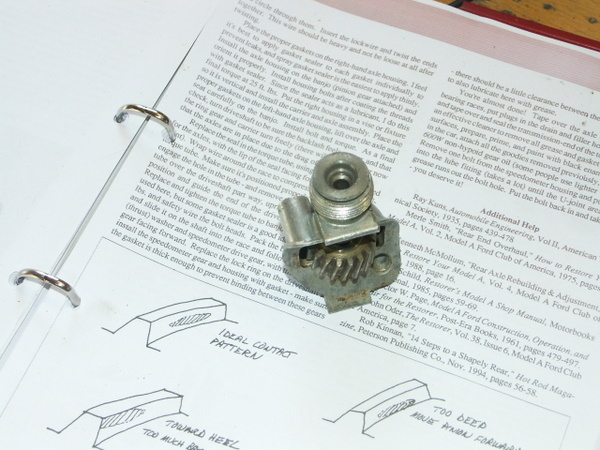 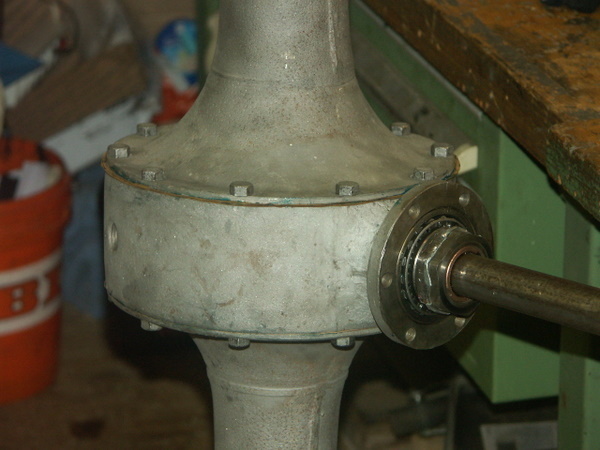 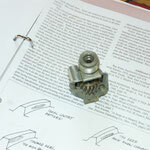 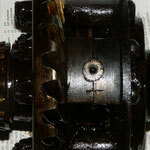 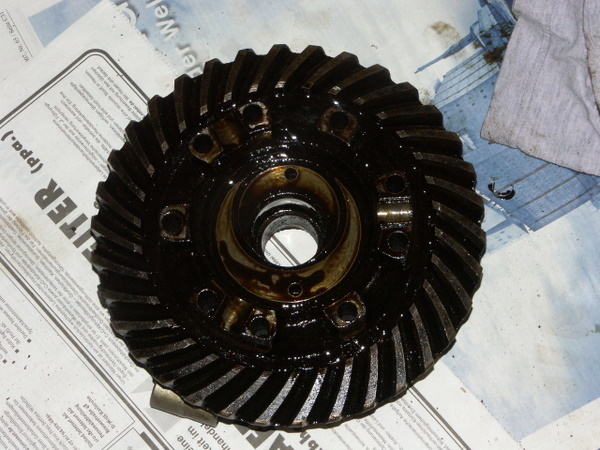 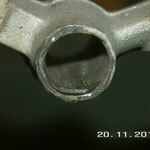 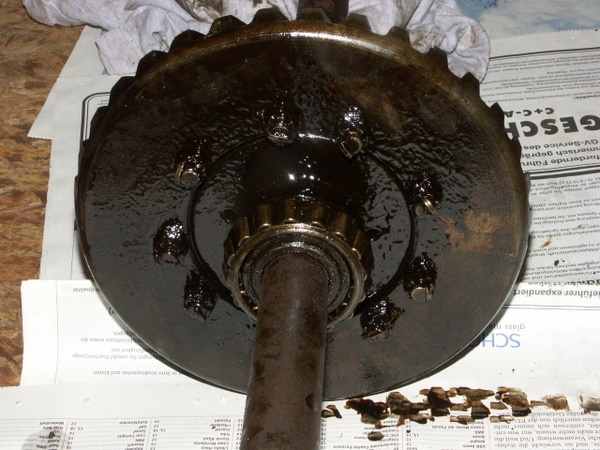 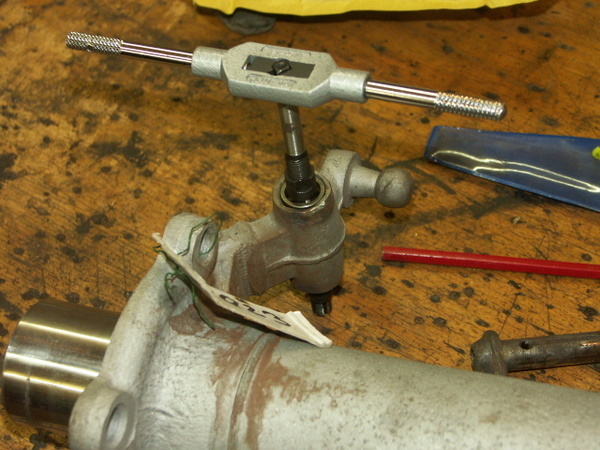 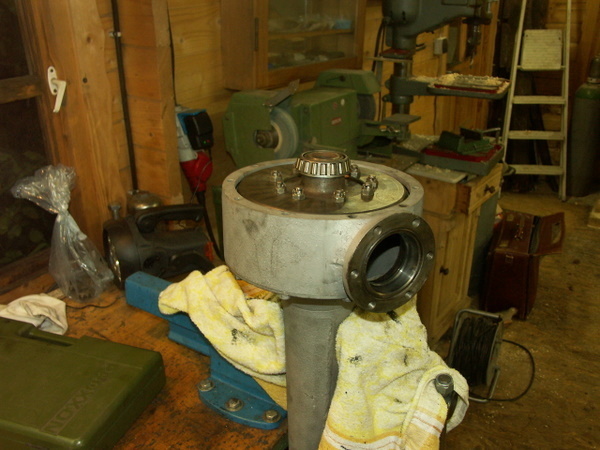 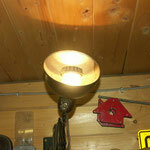 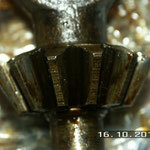 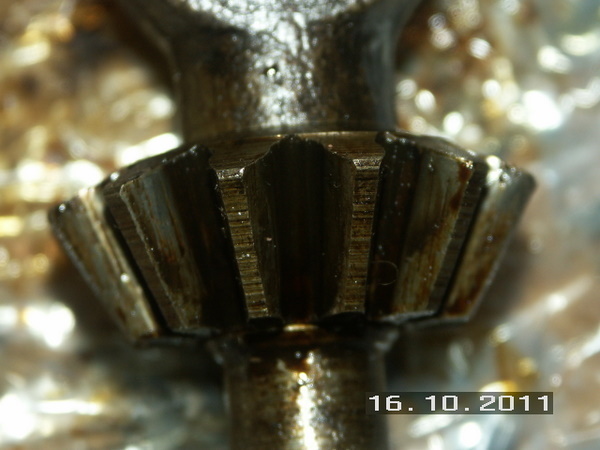 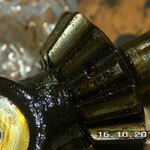 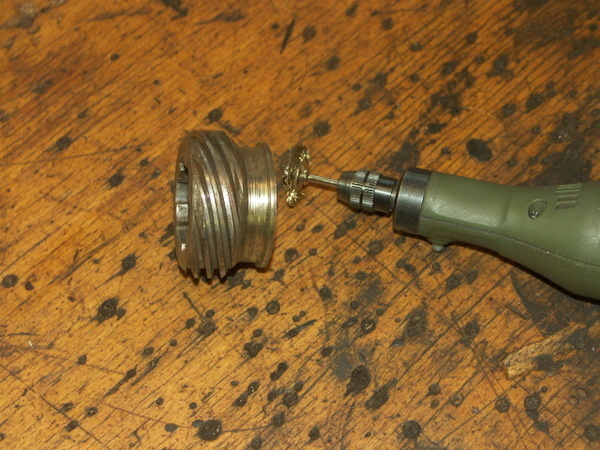 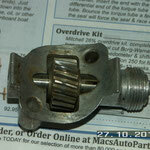 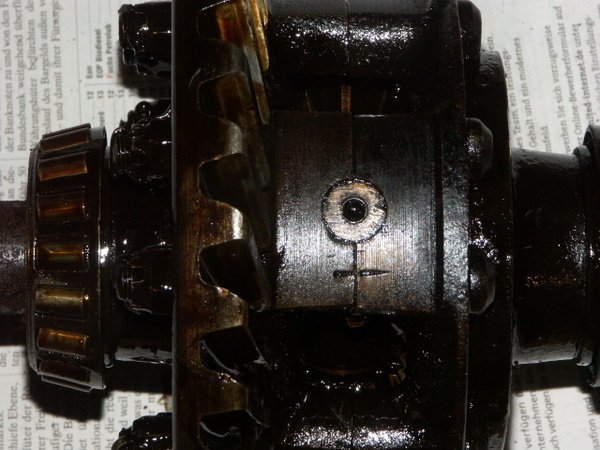 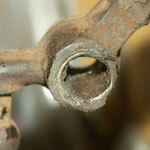 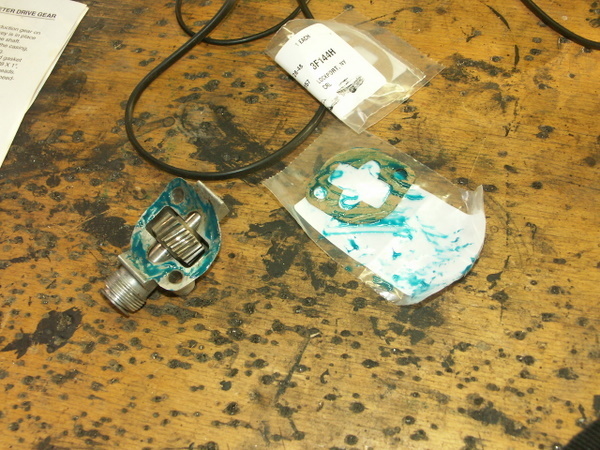 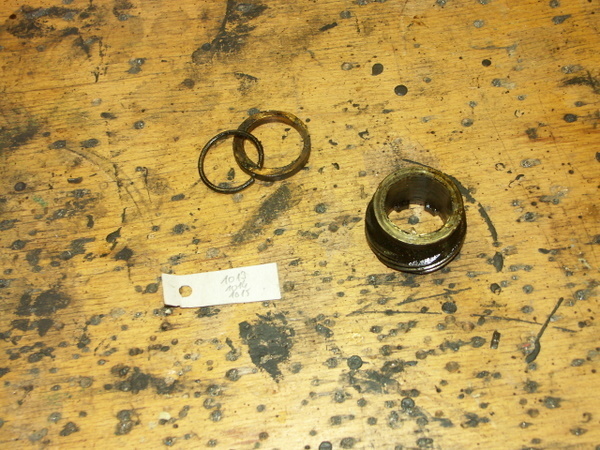 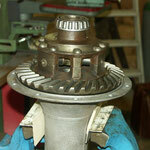 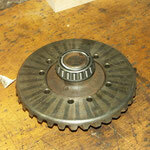 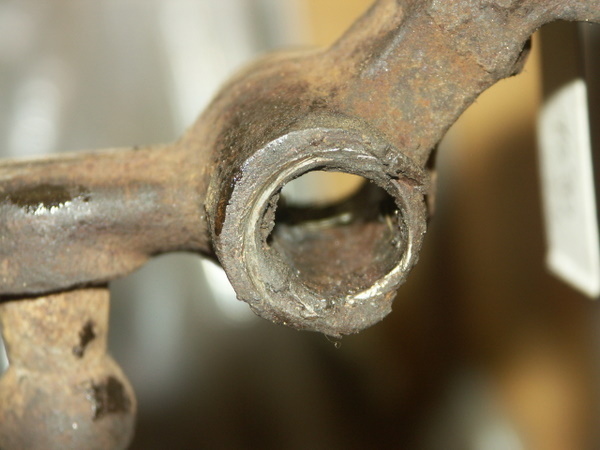 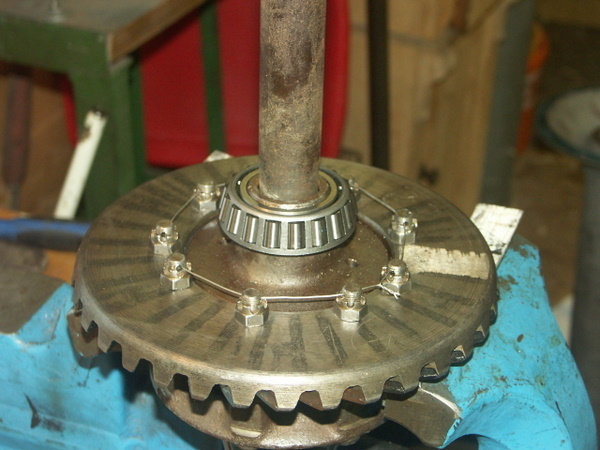 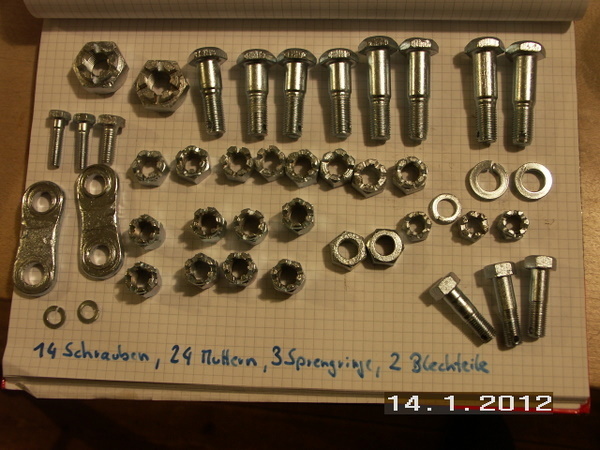 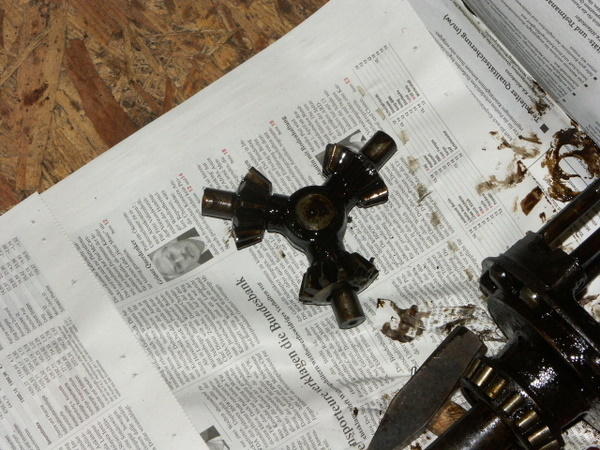 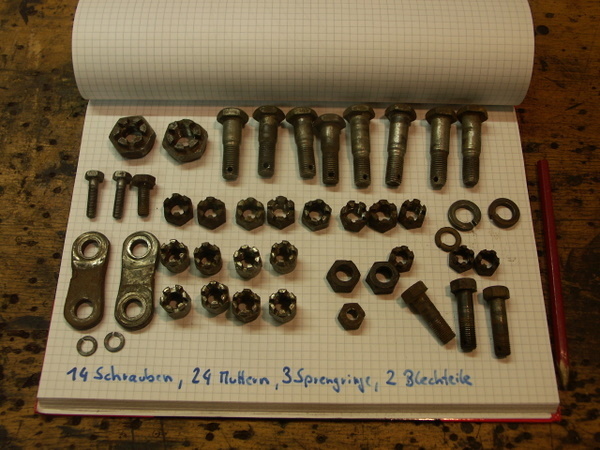 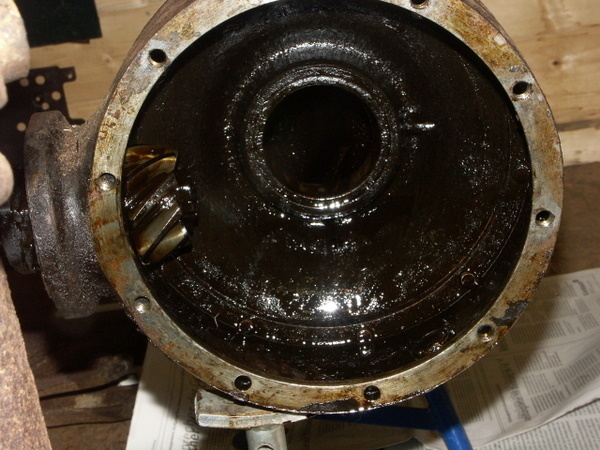 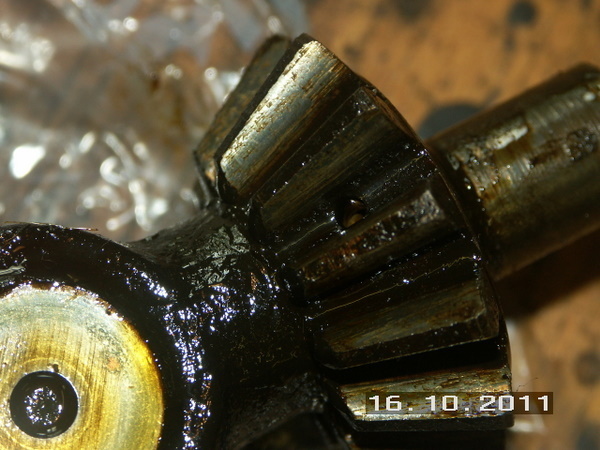 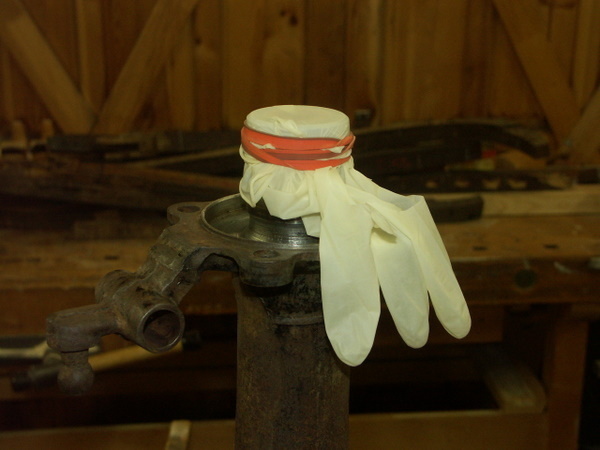 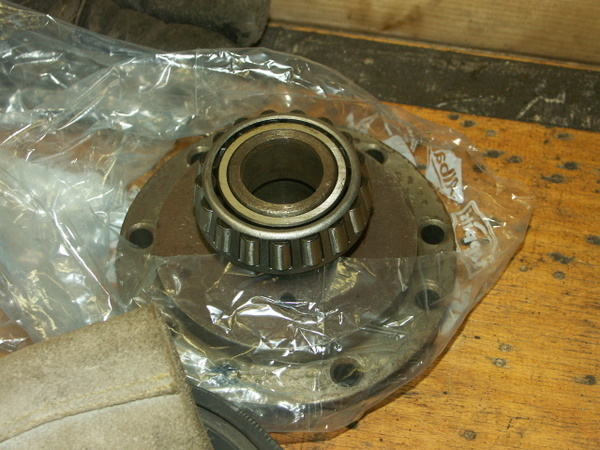 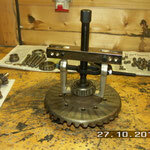 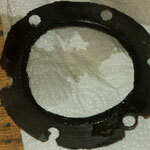 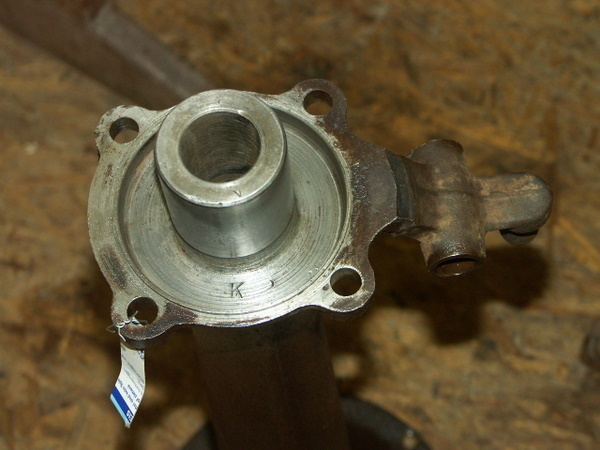 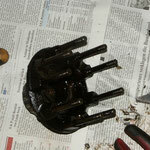 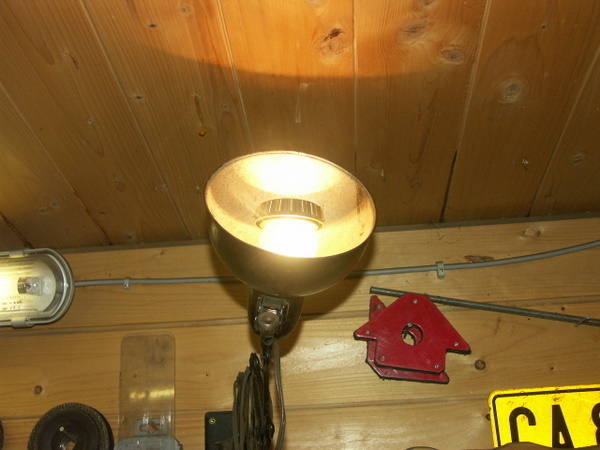 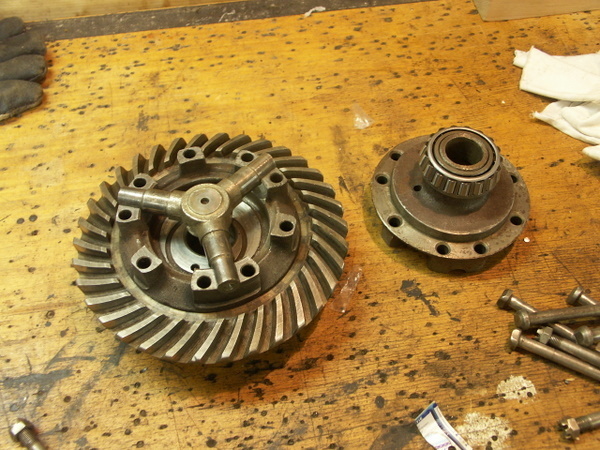 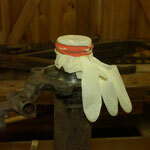 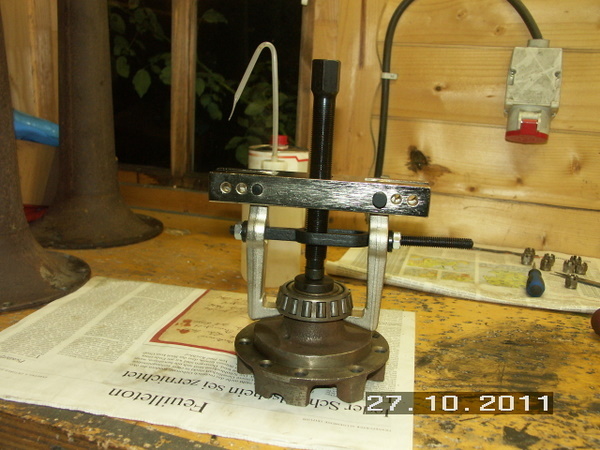 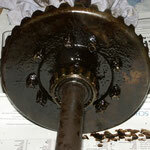 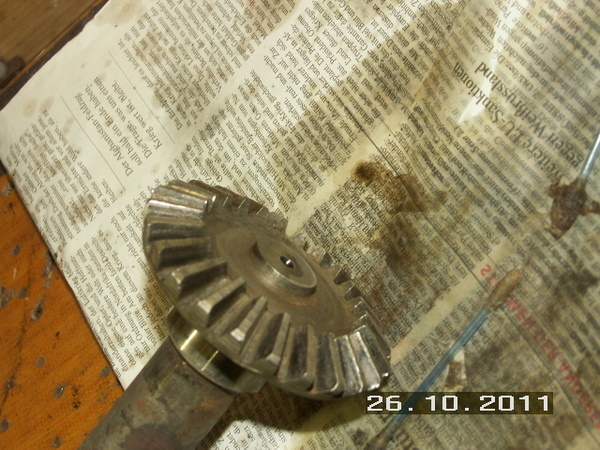 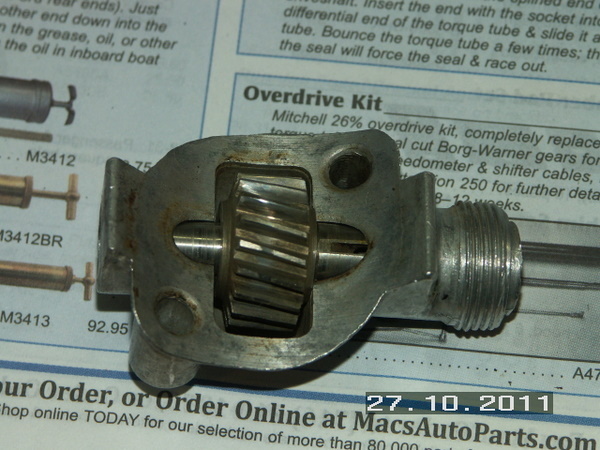 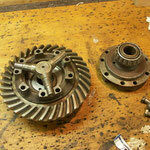 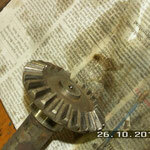 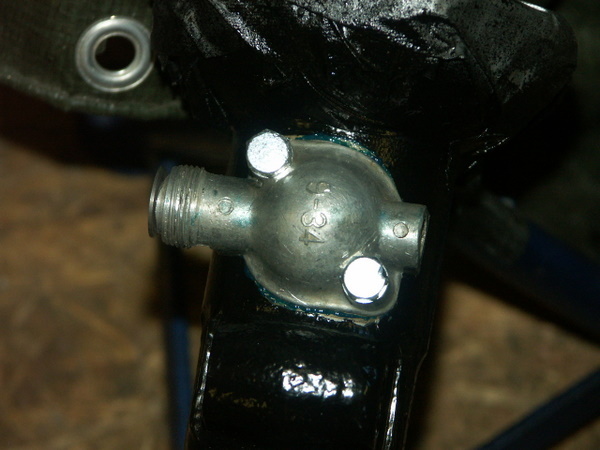 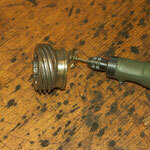 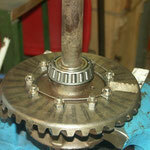 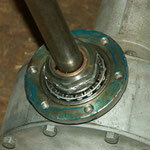 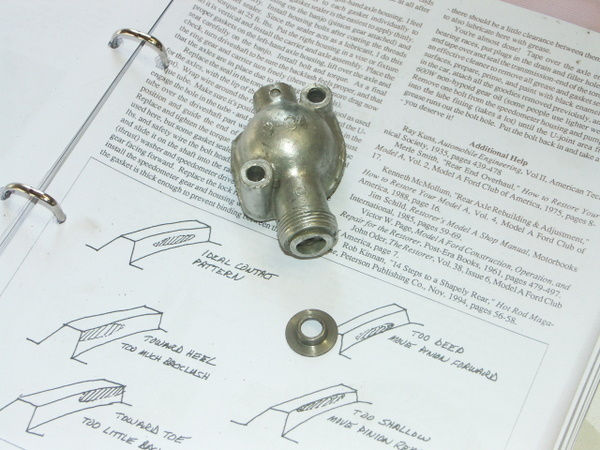 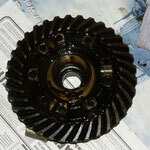 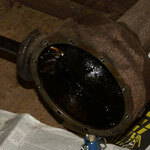 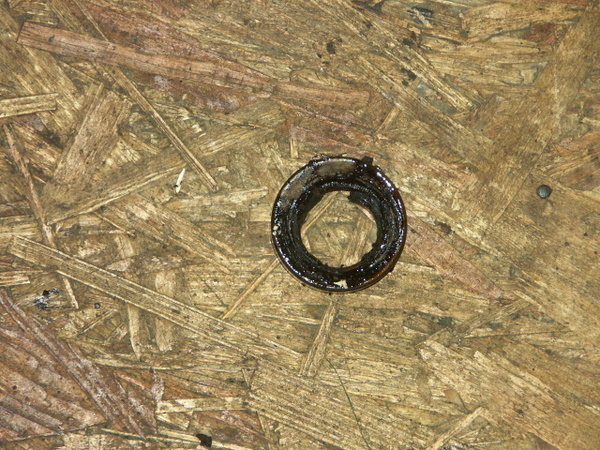 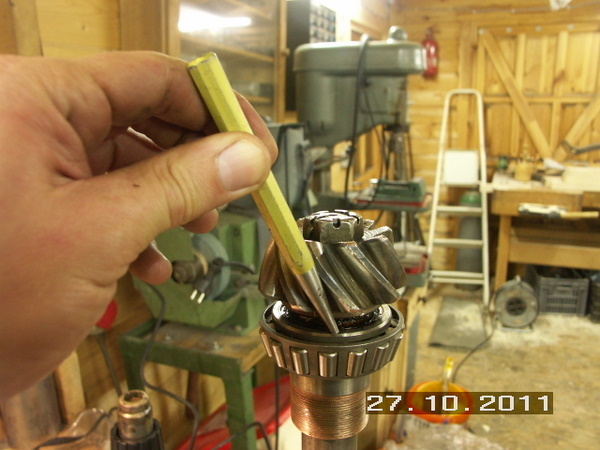 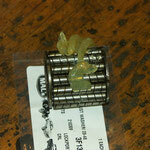 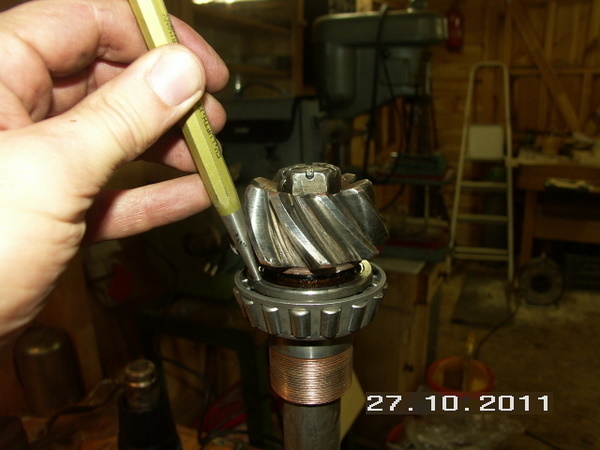 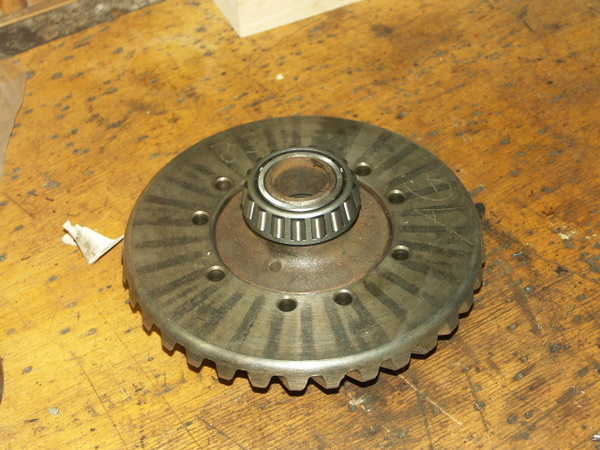 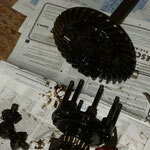 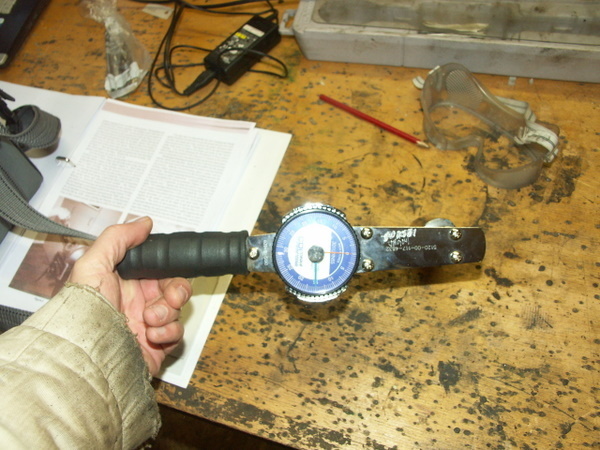 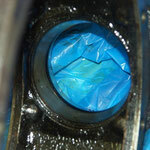 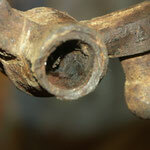 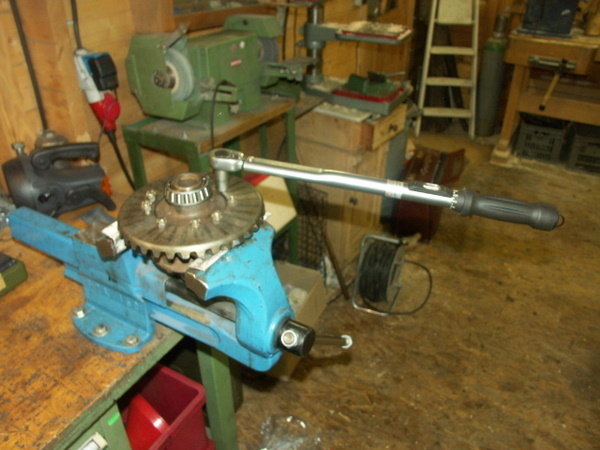 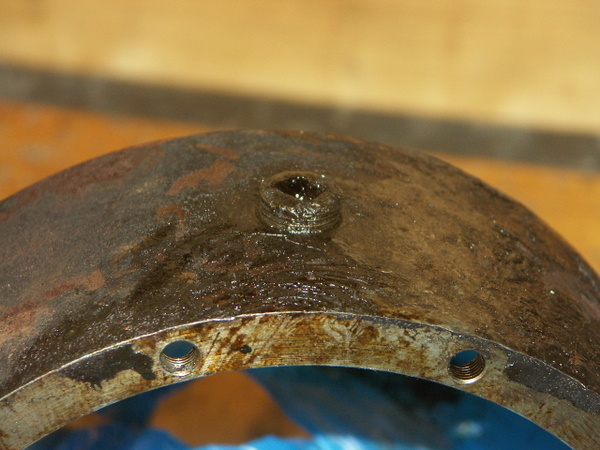 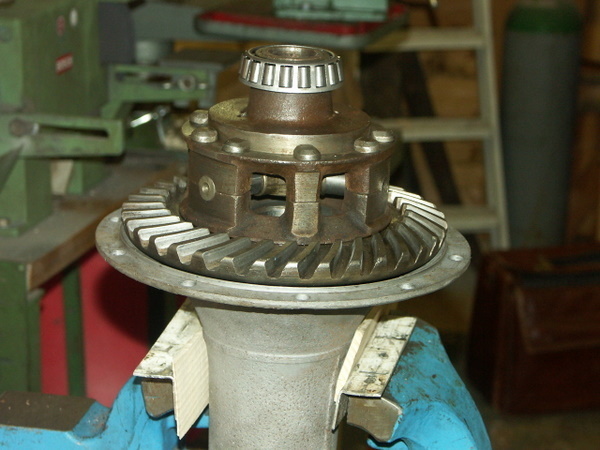 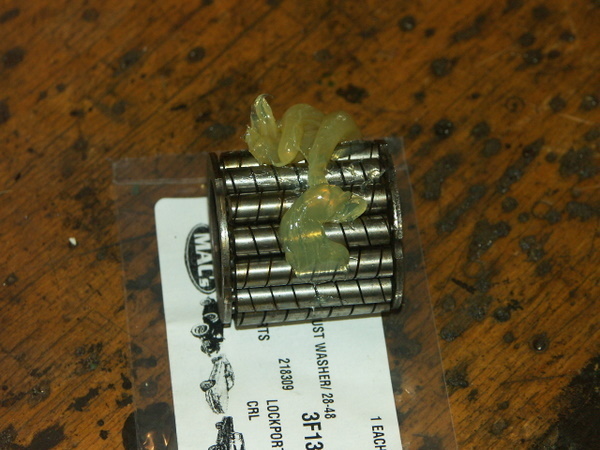 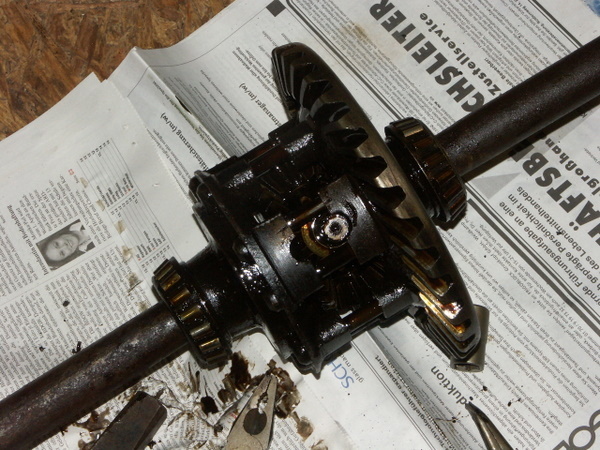 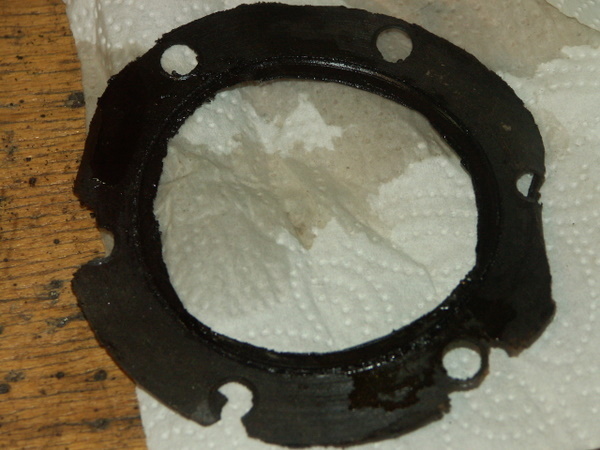 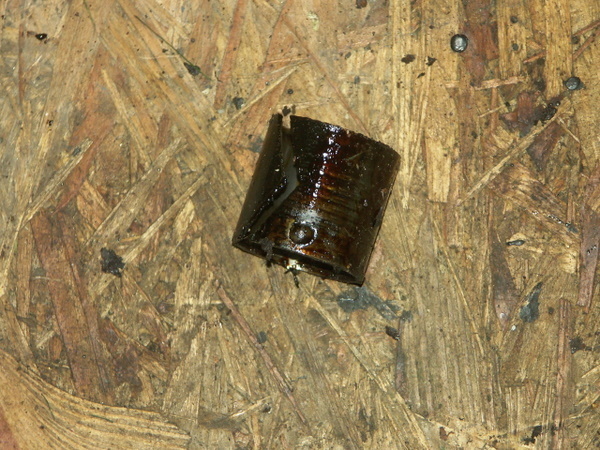 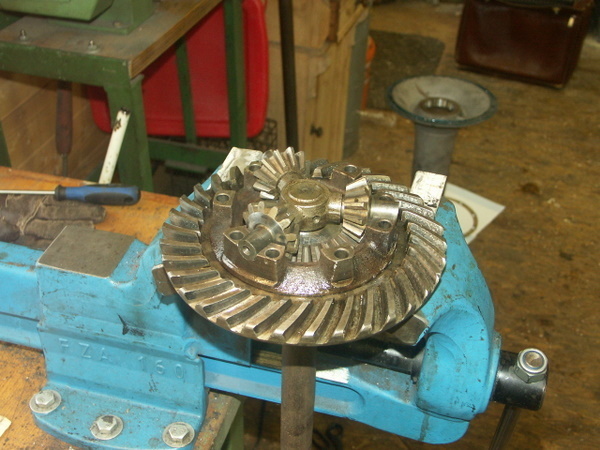 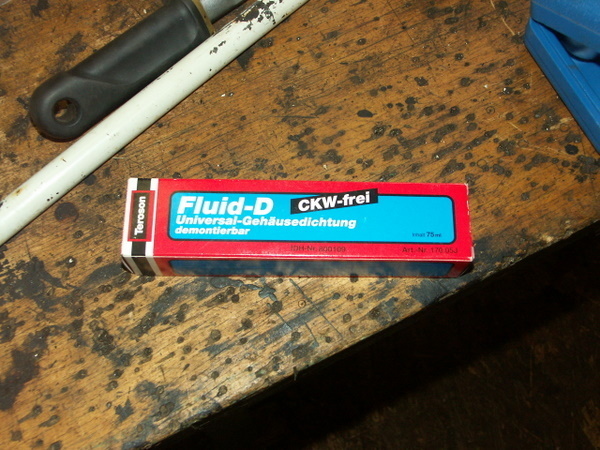 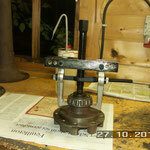 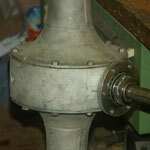 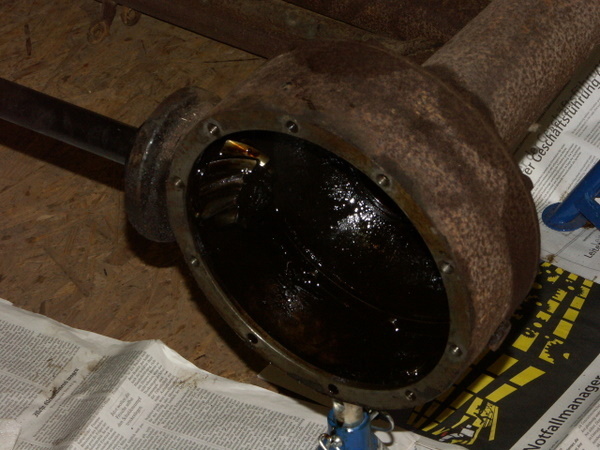 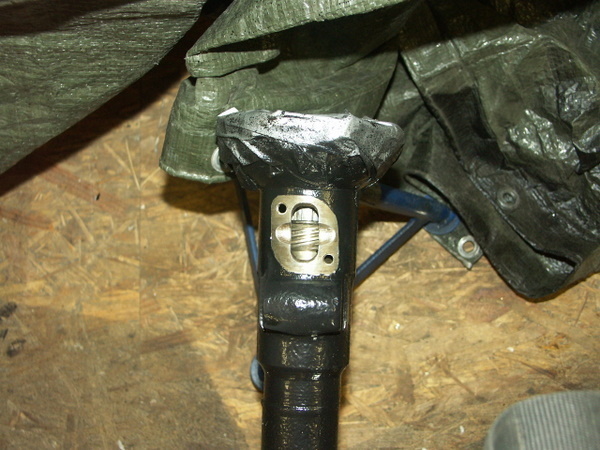 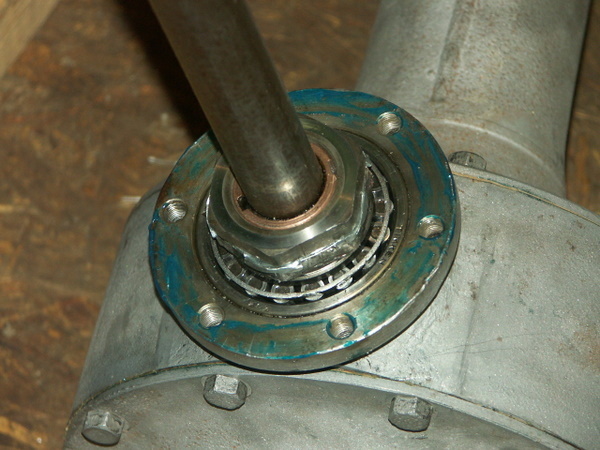 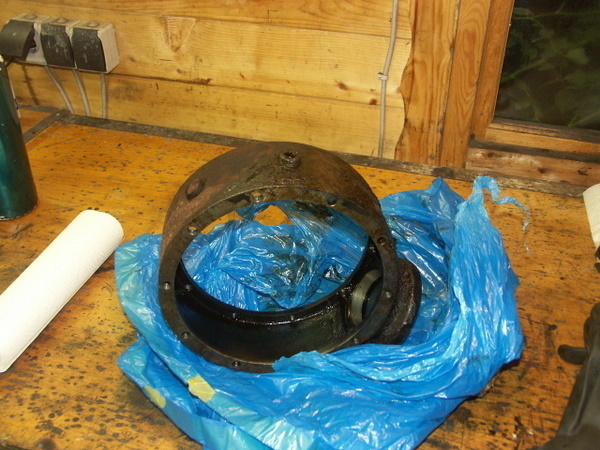 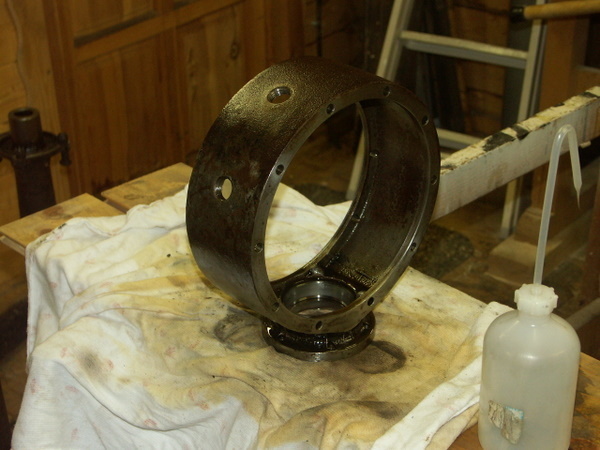 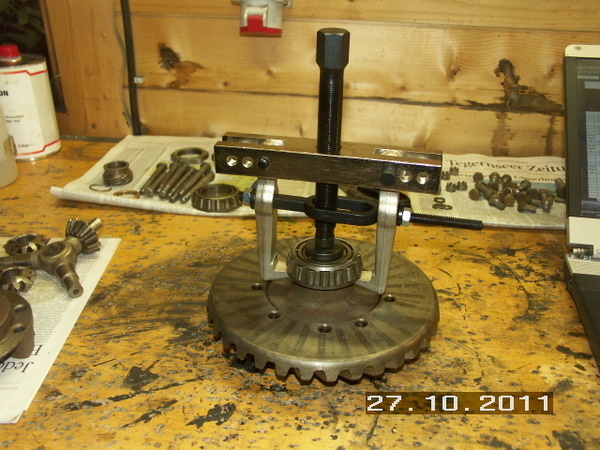 The spider gear was replaced by an original one with holes for lubrication.